It’s no secret I’m not the best sugar crafter or cake decorator. 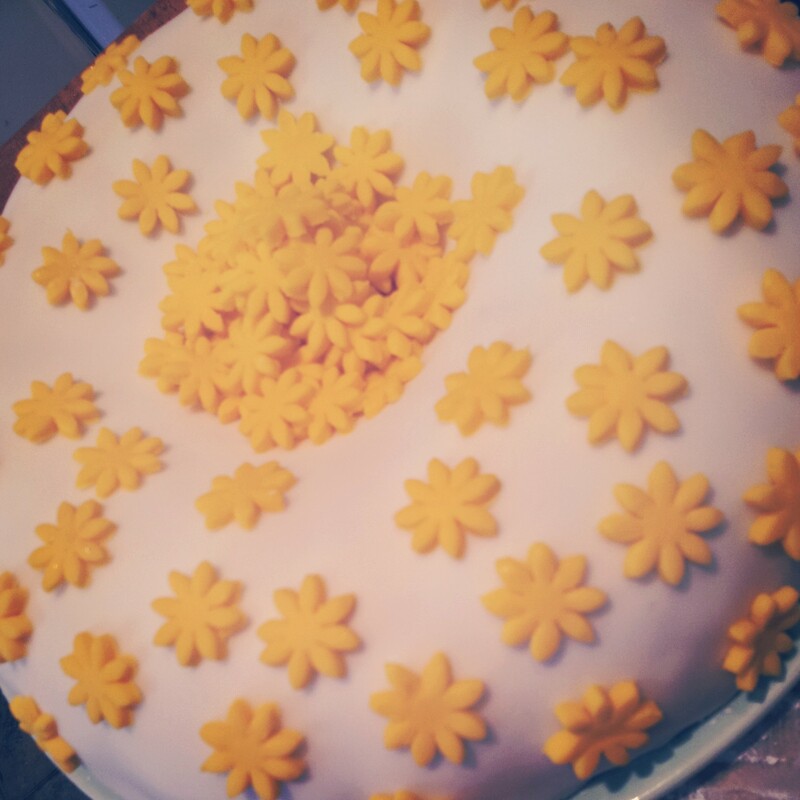 I’m still finding my feet when it comes to making pretty cakes. 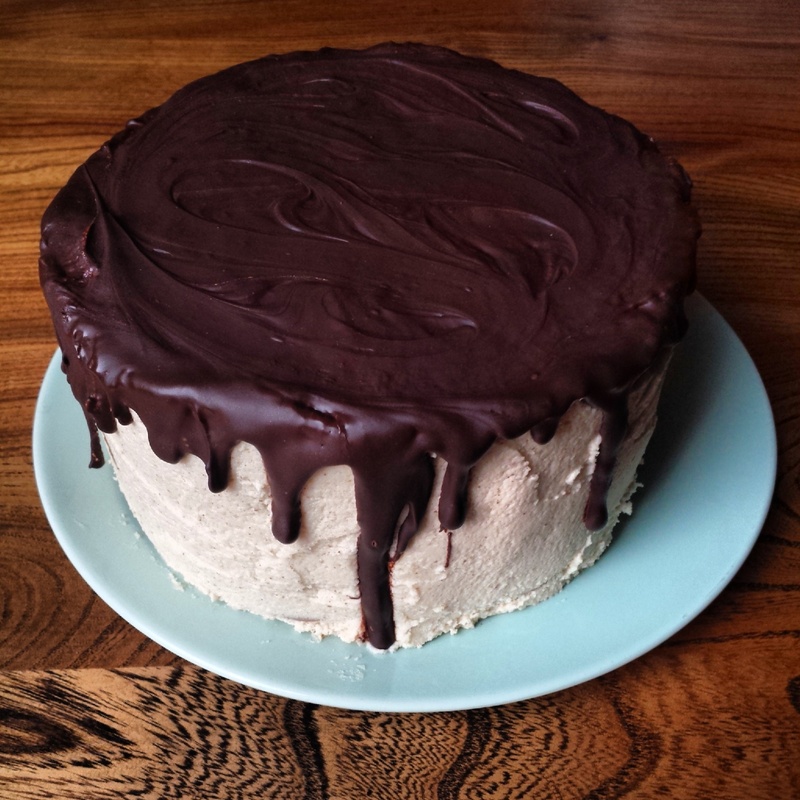 I’m more at home pouring loads of ganache over a cake and hoping for the best. 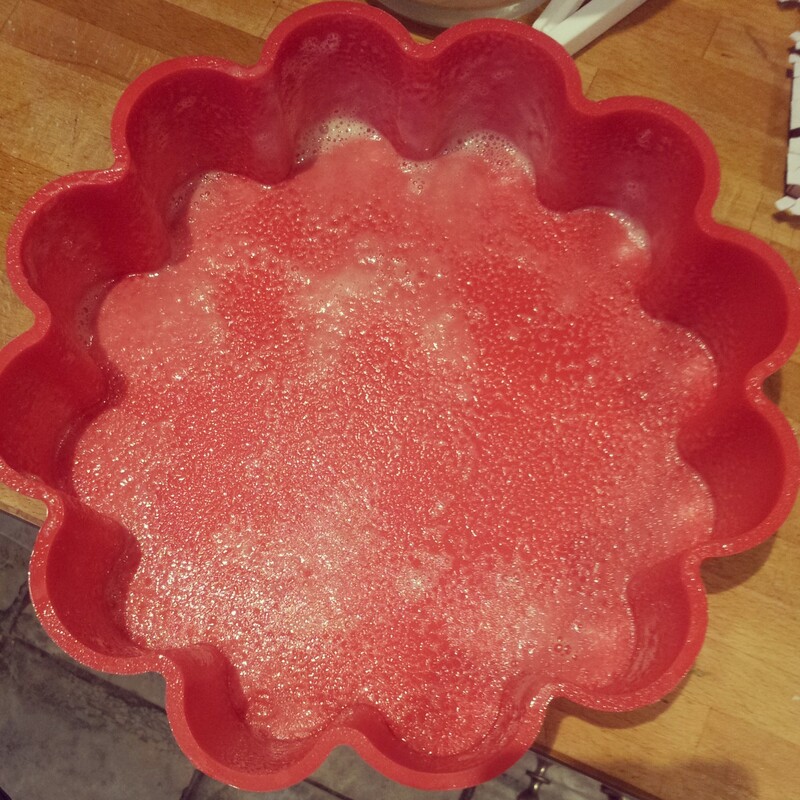 So why on earth did I decide to attempt to cover a bundt cake with fondant icing you may wonder?! I’m always up for a challenge and this really was a test of my cake decorating abilities. 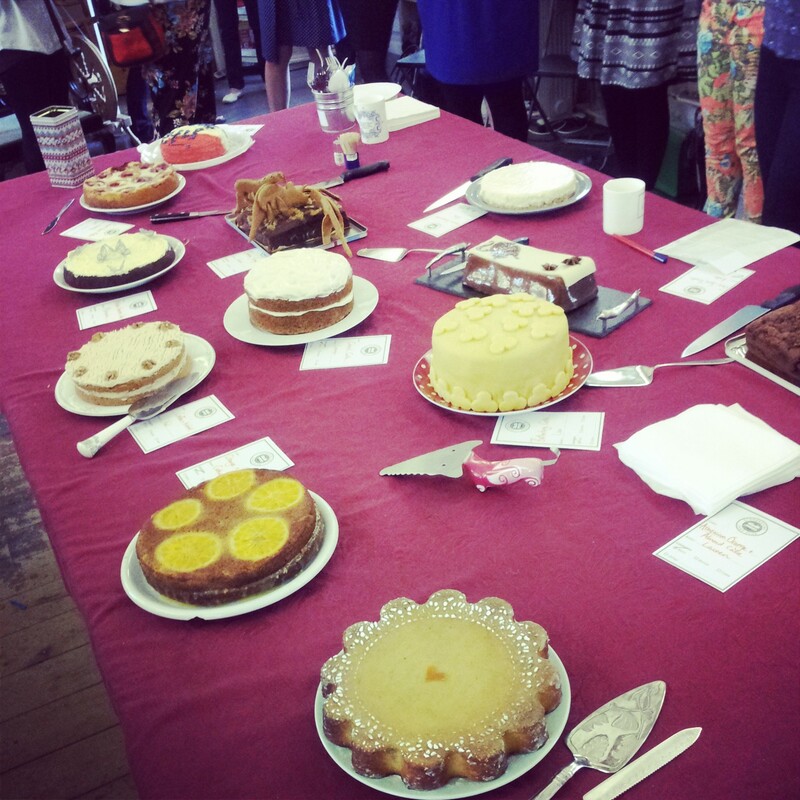 I was invited to participate in Renshaws Baking Competition. The challenge? 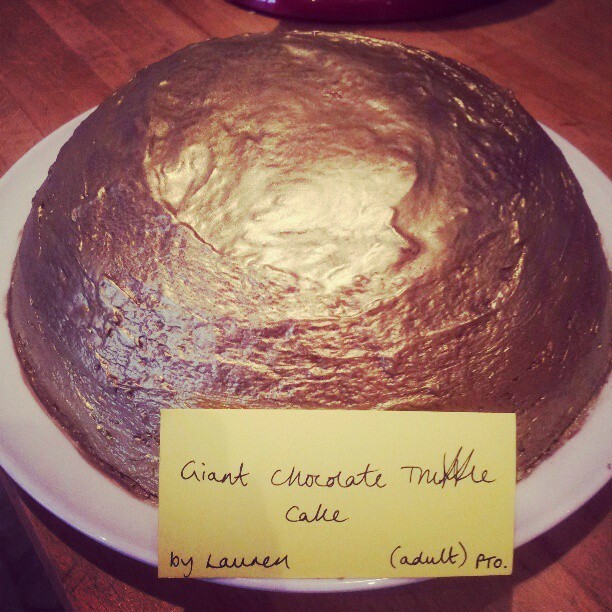 To bake and decorate a cake fit for the next heir to the throne, to welcome Baby Windsor into the world. My initial idea was to make a 3D crown, hence the bundt cake. however it seems my imagination is far more advanced than my sugarcrafting skills. 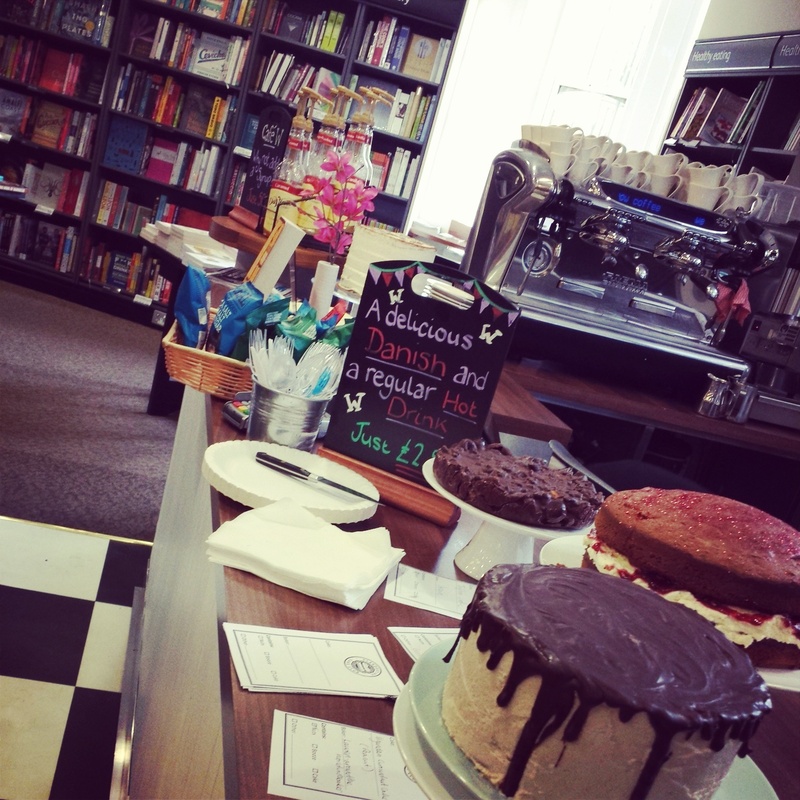 What flavour cake do you bake for the royals? 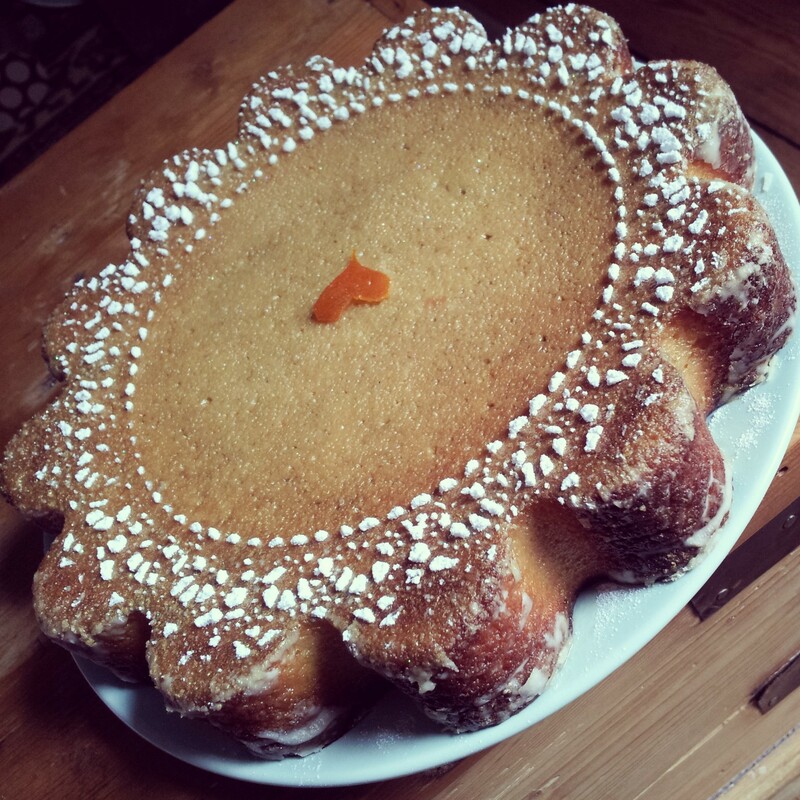 Well, I know Kate enjoyed a few Lavender shortbreads during her pregnancy, so a Lavender Madeira Bundt Cake I baked. Hoping that she hasn’t since developed an aversion to lavender. Not that Kate’s ever going to actually eat this cake, but you know it’s the thought that counts. One of the reasons I don’t venture into sugarcraft very often is that there isn’t a lot of space in my kitchen. Attempting to roll my crown out meant there was a bit of droppage on the floor. 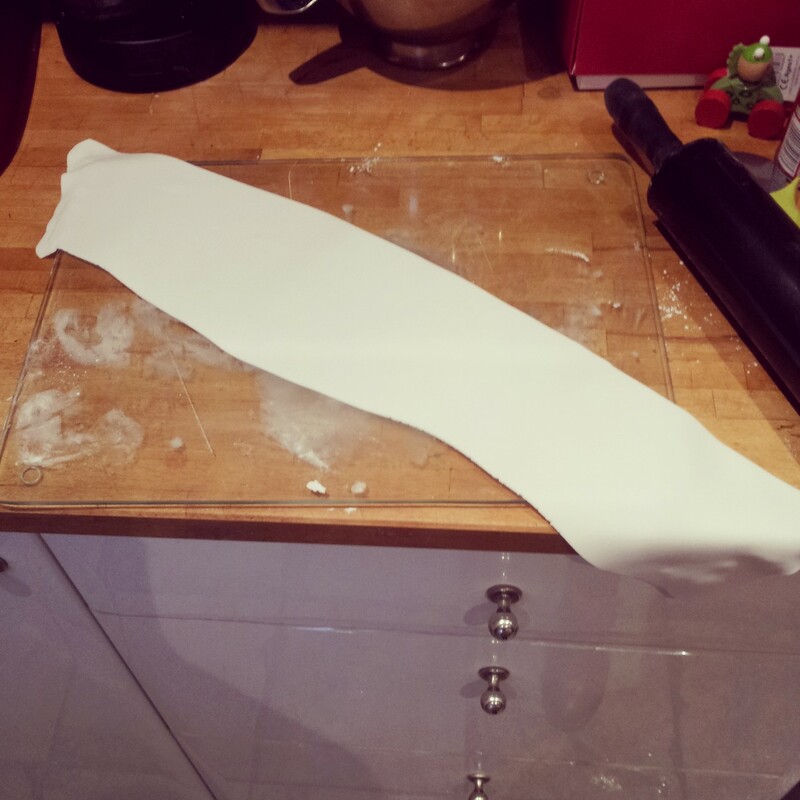 I rolled the fondant as thin as I could manage in one rectangular piece. 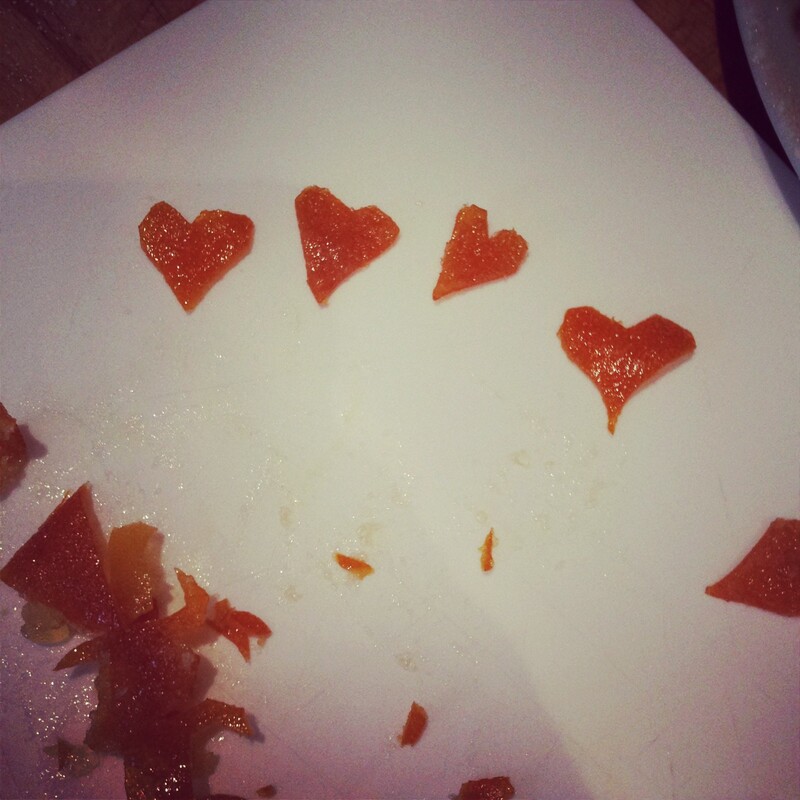 I don’t own any proper sugar crafting knives so wielding the pizza cutter I attempted to fashion some crown shapes. 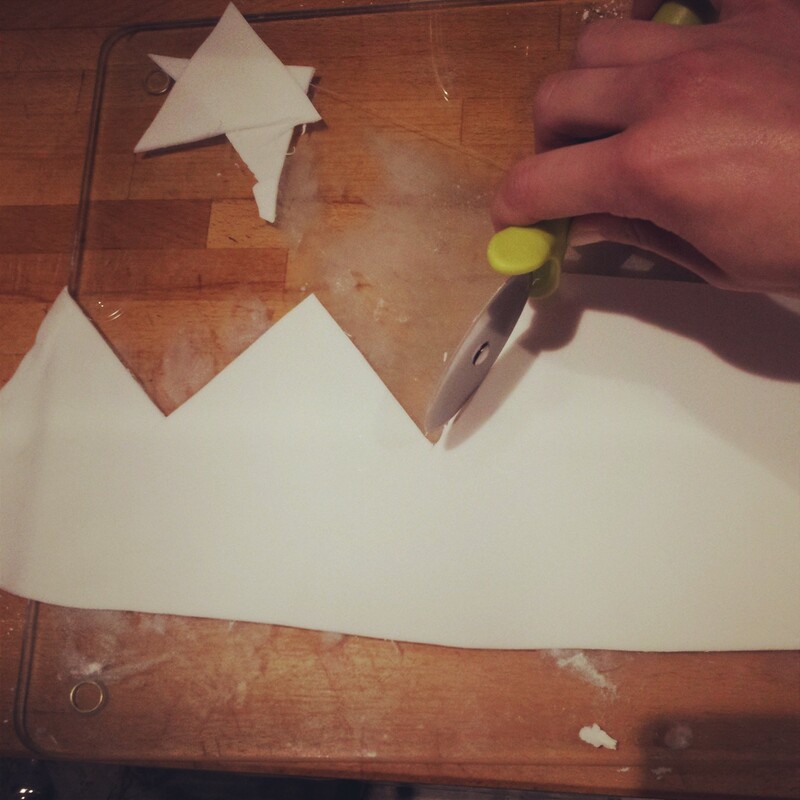 Cutting triangles out of the fondant. 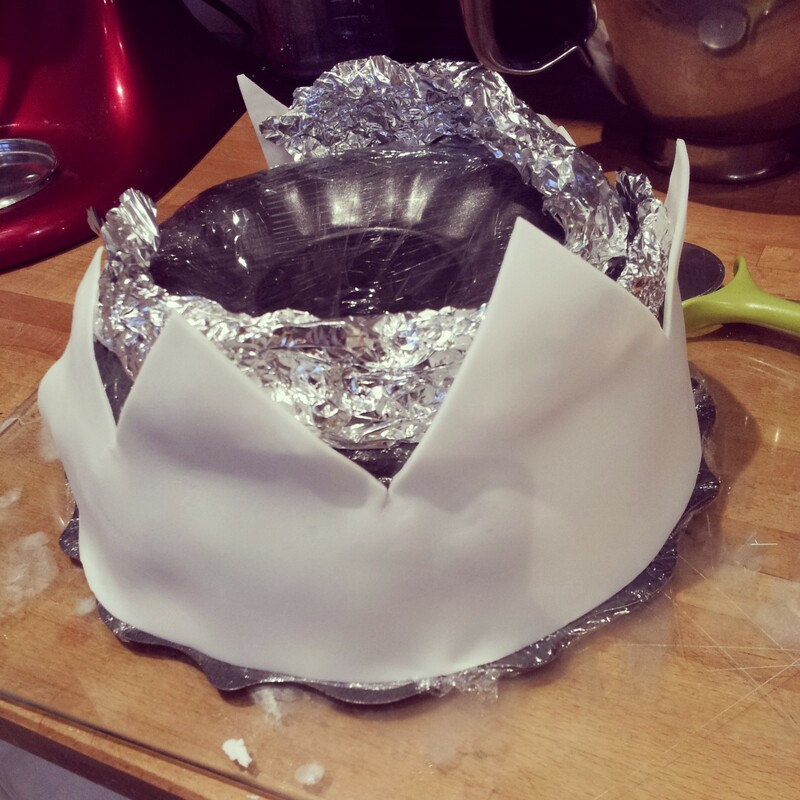 Once I had my basic crown shape I gently lifted it onto a cling film covered bundt tin. and held the pointy ends in place with a crumpled horseshoes of tin foil. 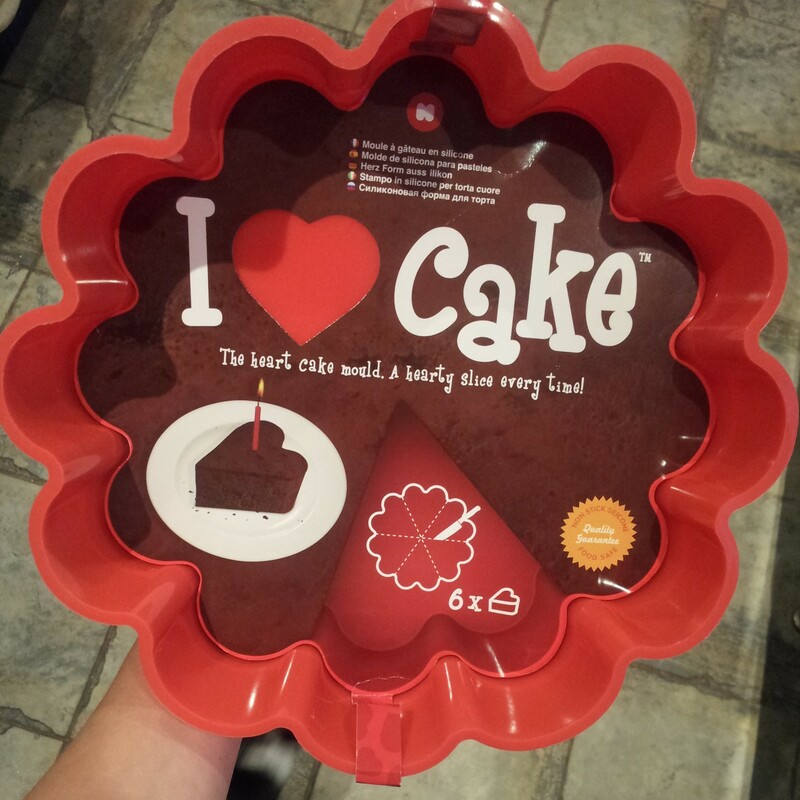 Unfortunately the bundt tin then needed to have a cake baked into it, so it all went to hell. The crown ended up as a crumpled mess, so I made another. This crown snapped after it dried. Admitting defeat I returned to the drawing board. 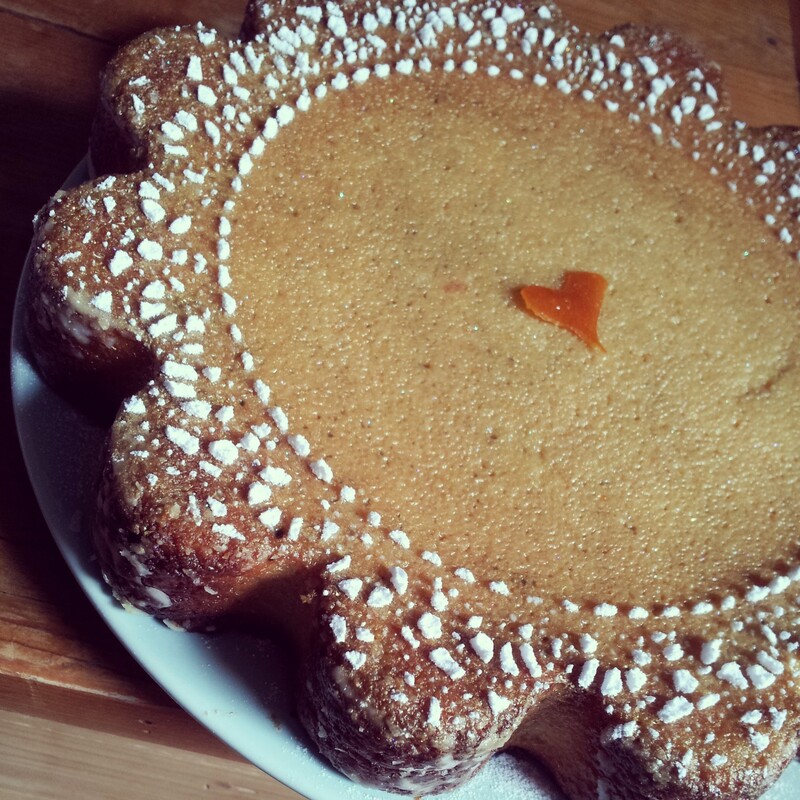 To help spur on my creativity I decided to apply a layer of marzipan to the lavender bundt. Applying a liberal coating of apricot jam to make it all stick. Bundts are not usually iced in this way and I can now see why. Pouring a whole lot of chocolate over a bundt is a much easier option. 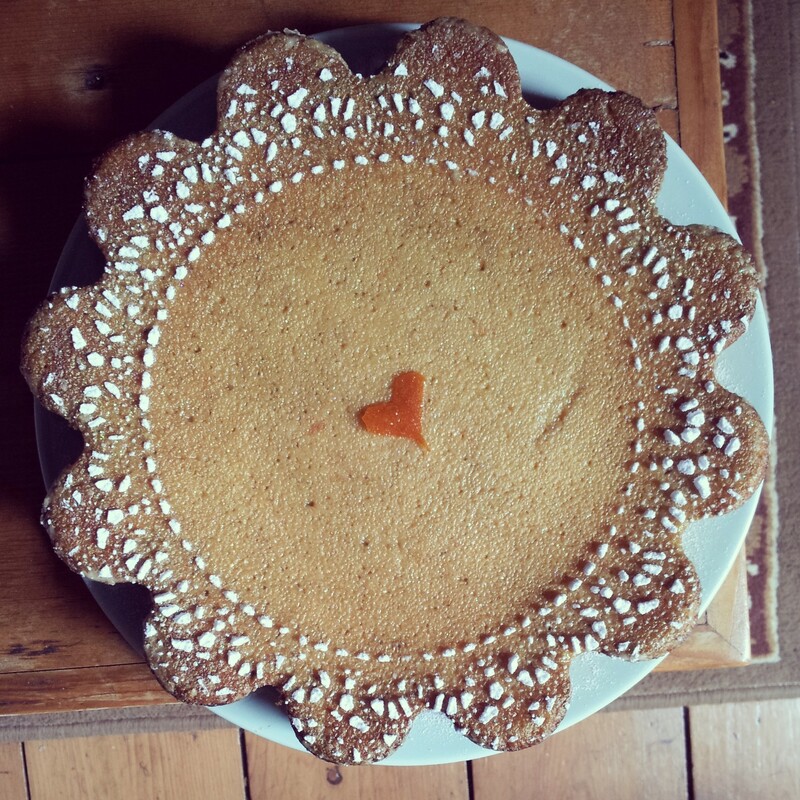 This traditional style of icing is best suited to a more circular cake with flat edges, like with my wedding cake. Anyway who said I had to be traditional! 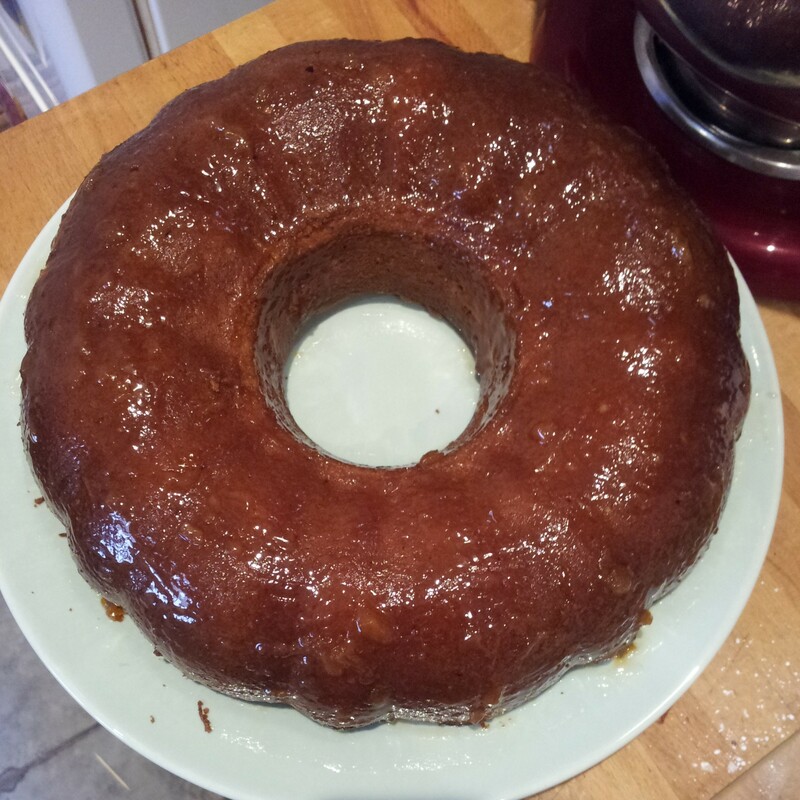 Undeterred I threw a thin layer of marizpan over the bundt and poked a hole in the marzipan, coaxing it into the inner ring and under the moulded edges of the cake. 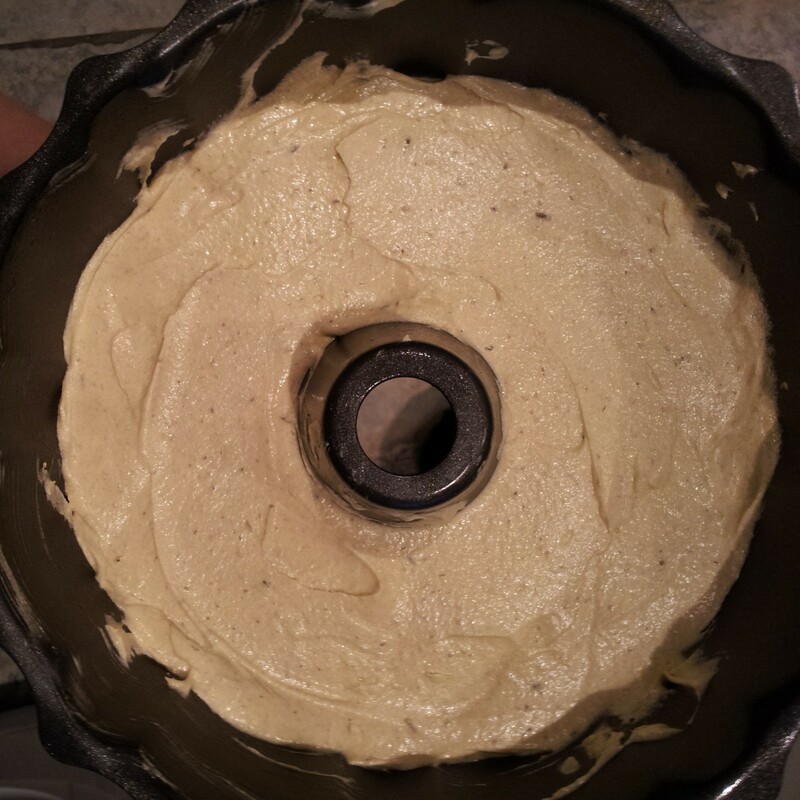 The most tricky bit is trying to get a thin layer of smooth white fondant icing to cover the bundt. 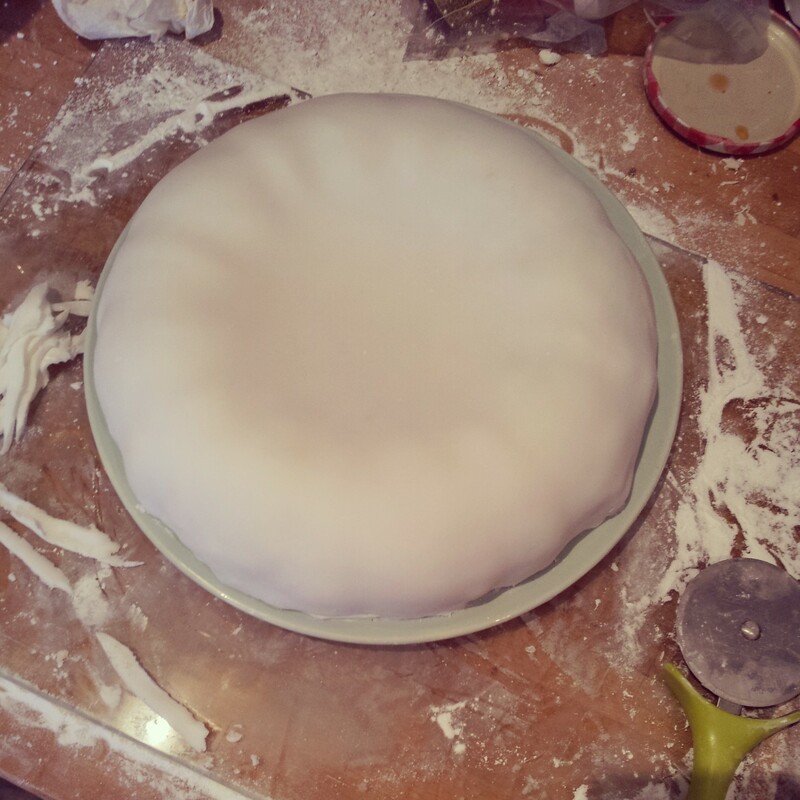 The Renshaw white fondant is really lovely to work with, so soft and smooth, but I had to add a lot of icing sugar to stop it sticking to the worksurface so I could lift it all up in one go over the rolling pin. 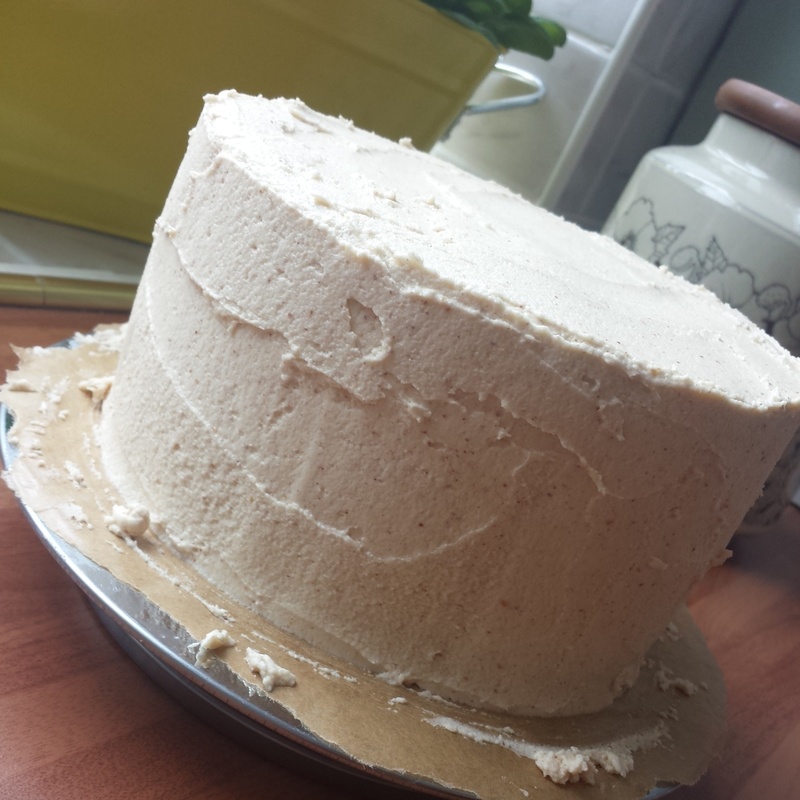 I didn’t have the courage to pop a hole in the middle of the white icing once I eventually got it on to the cake. 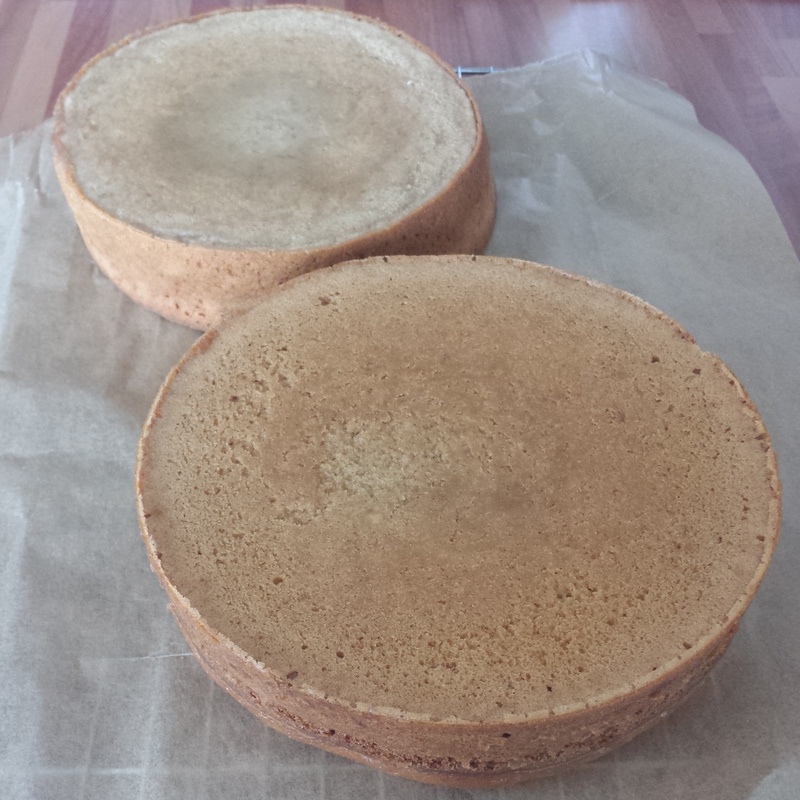 I couldn’t have faced more rolling after it took me a good few goes to get it the right size to fit the cake. It took a bit of manoeuvring in my little kitchen to get it to work but once in place it worked a treat! Using the palm of my hand I smoothed the fondant and buffed it to a nice sheen so a hint of the moulding of the bundt can be seen through the icing. Terrible crown attempt number 2. 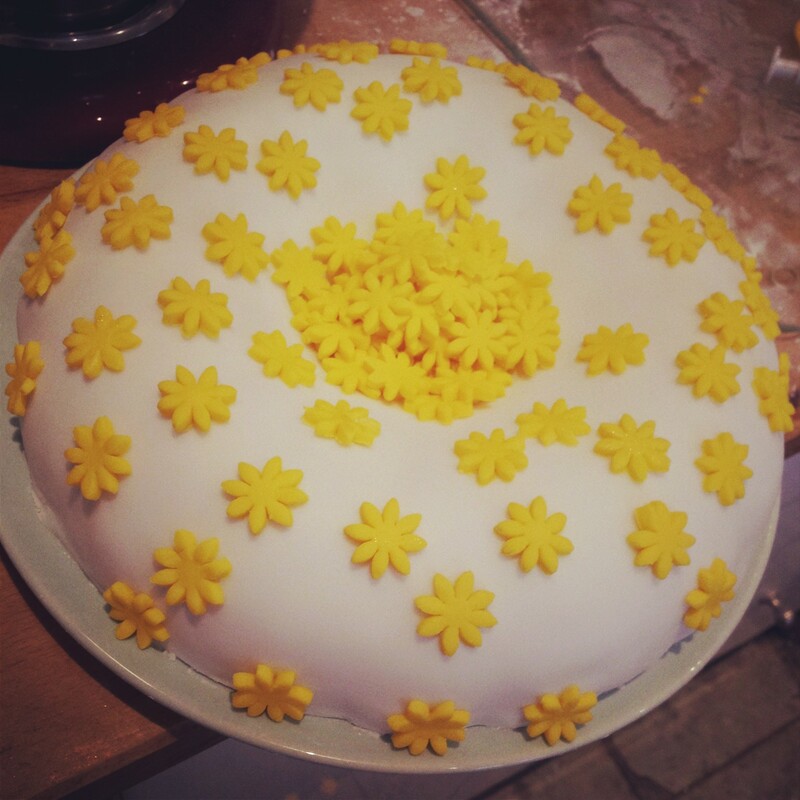 In a bid to create a royal crown for my baby cake I cracked open a pack of yellow fondant. I clearly had to give up on my crown idea, as this looked more like a wonky chimney. A new approach was needed. I give up on the crowns let’s make flowers instead! And that approach is always flowers! I have a few sugar craft tools in my kitchen, most of which tend to be flowers or stars. 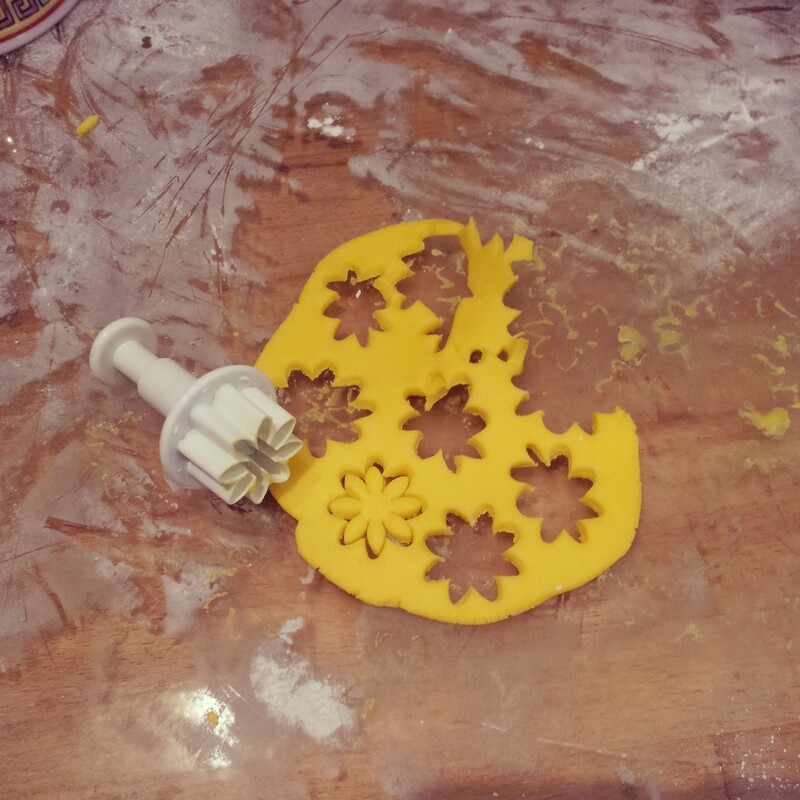 The yellow sugar paste was really easy to handle. 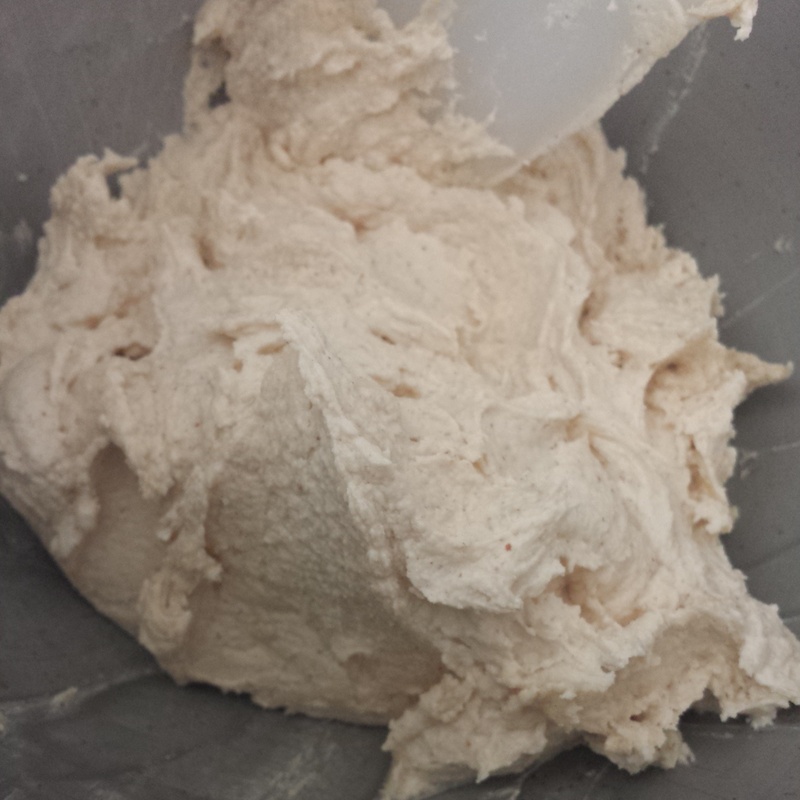 As it was so soft it didn’t really require any kneading to make it more pliable. It was good to go straight from the packet. As we don’t know if the baby is a girl or a boy (yet) I chose the gender neutral buttercup yellow. 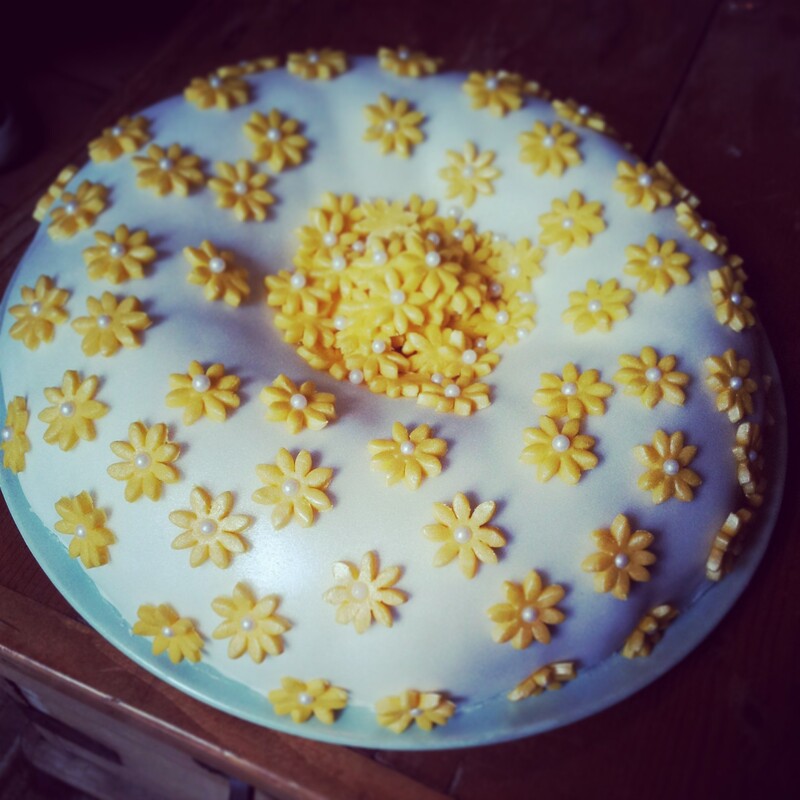 I whacked a whole load of yellow buttercups randomly all over the bundt straight from the cutter. 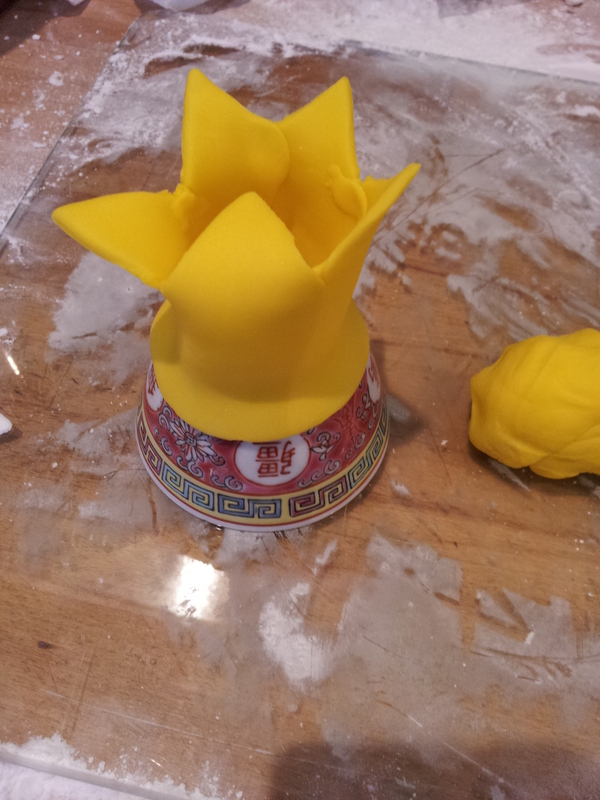 As the white fondant and the yellow sugar paste were still moist no edible glue was needed to hold the flowers in place. You could add some for extra security if you like, but the fondants bonded instantly and let me crack on with cutting as many flowers as possible. 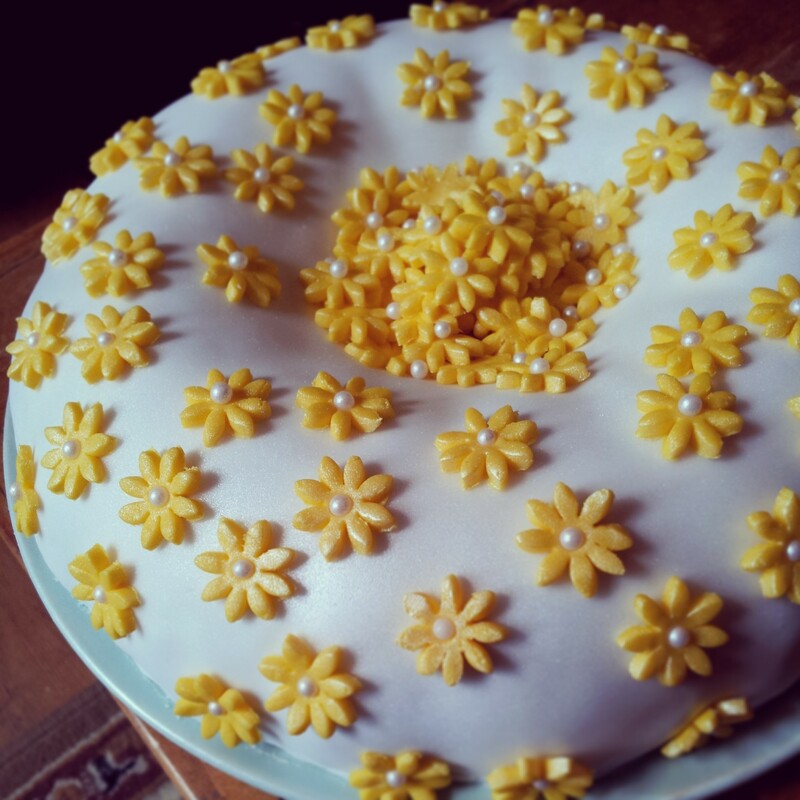 Just when I started to think I was almost finished, I kept on cutting flowers and piling them up in the centre of the bundt to create a bouquet of buttercups fit for the Duchess. 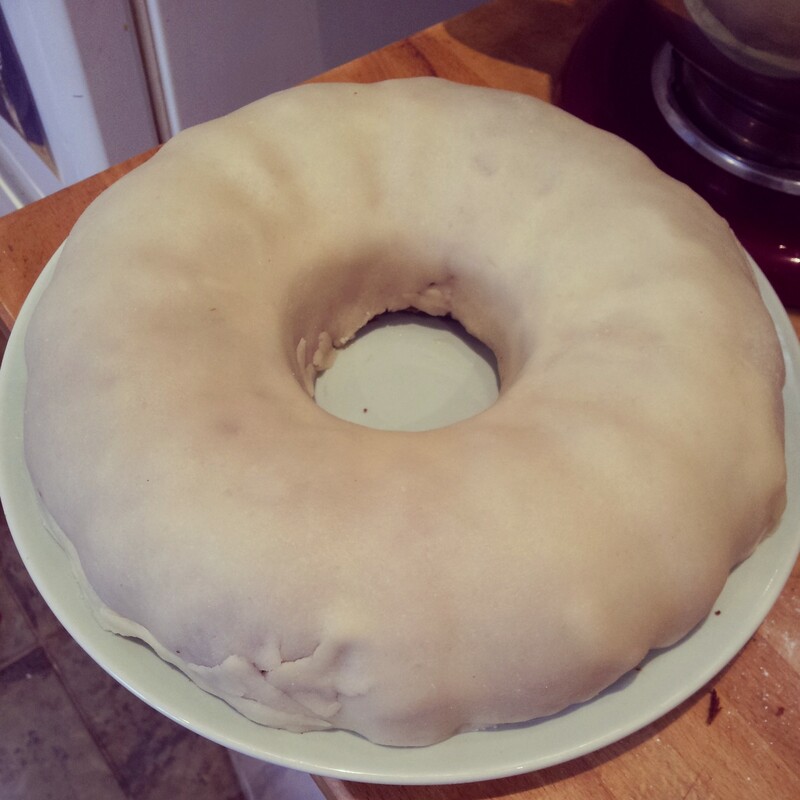 I realised that my bundt was starting to resemble a 1970s swimming cap. I was going for a vintage look but no one wants to eat a swimming cap, especially not Kate Middleton and Wills. The flowers required a lift. Spray on silver lustre is always my go to when cakes need a little something extra. It’s my pièce de résistance. And yet it still wasn’t enough. Back to my cupboard and I discovered a pot of edible pink pearls. Terrific! 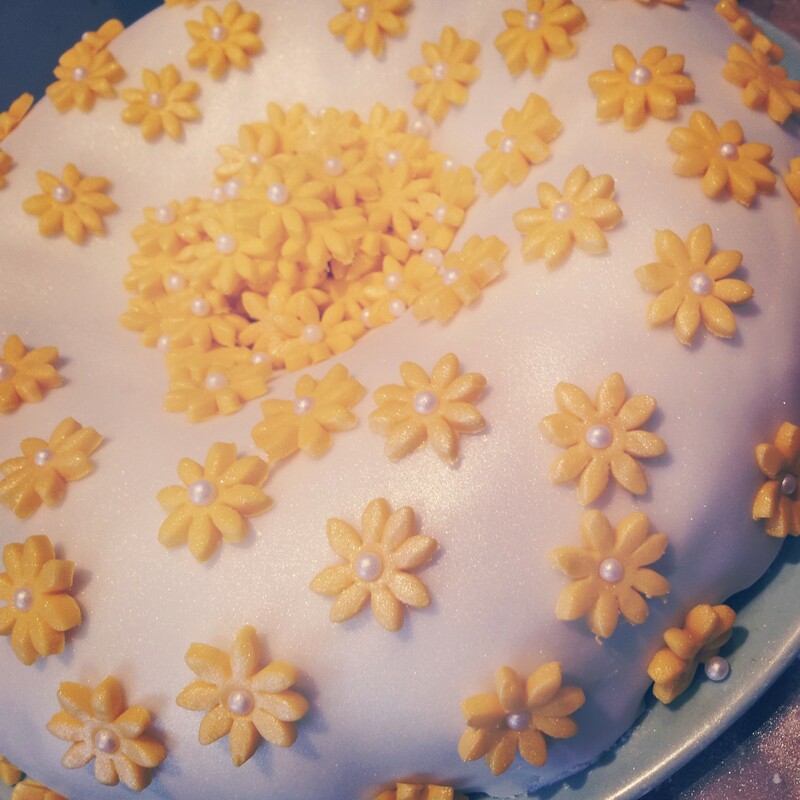 I studded the still supple yellow fondant flowers with a pearl in the centre. This (in my opinion) makes all the difference. Pushing the pearls carefully into the centre of each flower added variance to the flowers, giving a more natural look and lifting the petals slightly from the cake. The added pressure also encouraged the bond between the fondants to help hold the flowers on to the cake. 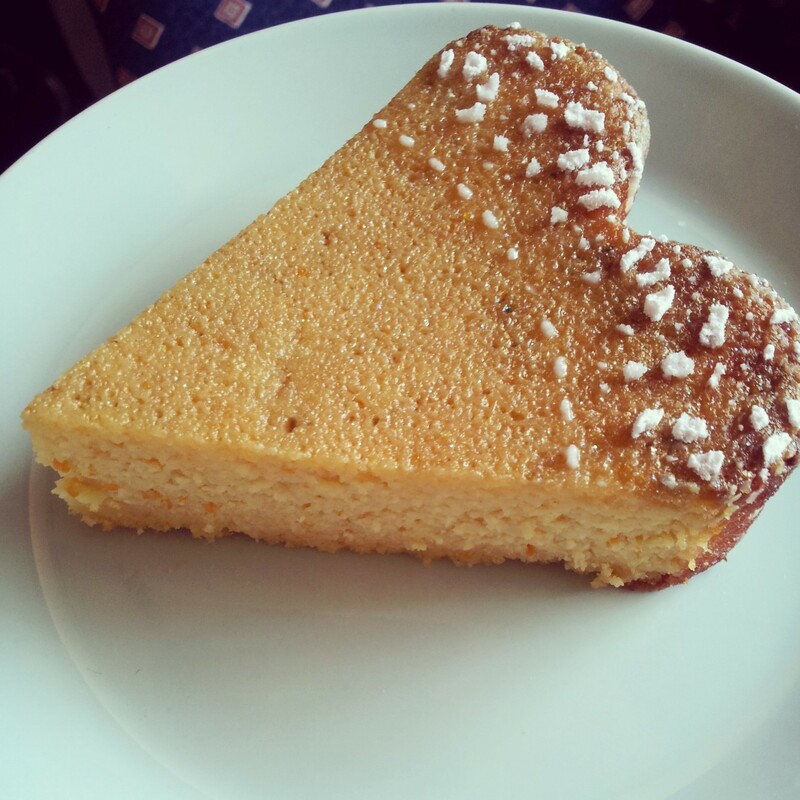 I love a bit of lavender in my baking, you can probably tell from all of the other cakes I’ve made. Lavender keeps coming back. Infusing caster sugar with lavender is so easy to do and gives you a naturally wonderful flavour that enhances any cake, shortbread, meringue, Madeleine or cupcake that takes your fancy. It’s subtle floral scent perfumes the house and soothes the soul (and tummy). 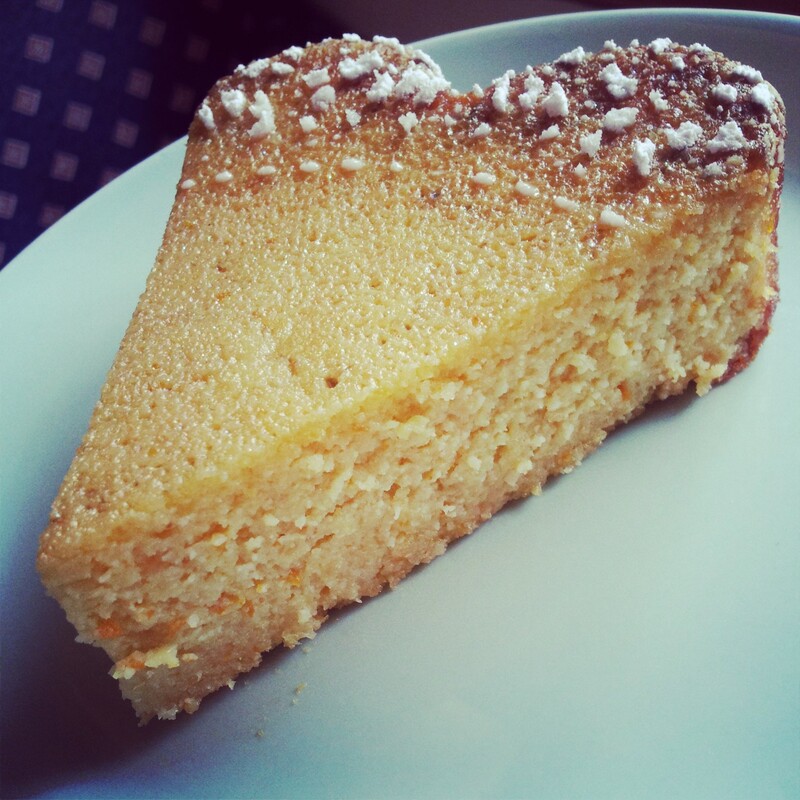 A nice hunk of lavender Madeira cake is best served with a strong cup of proper tea. 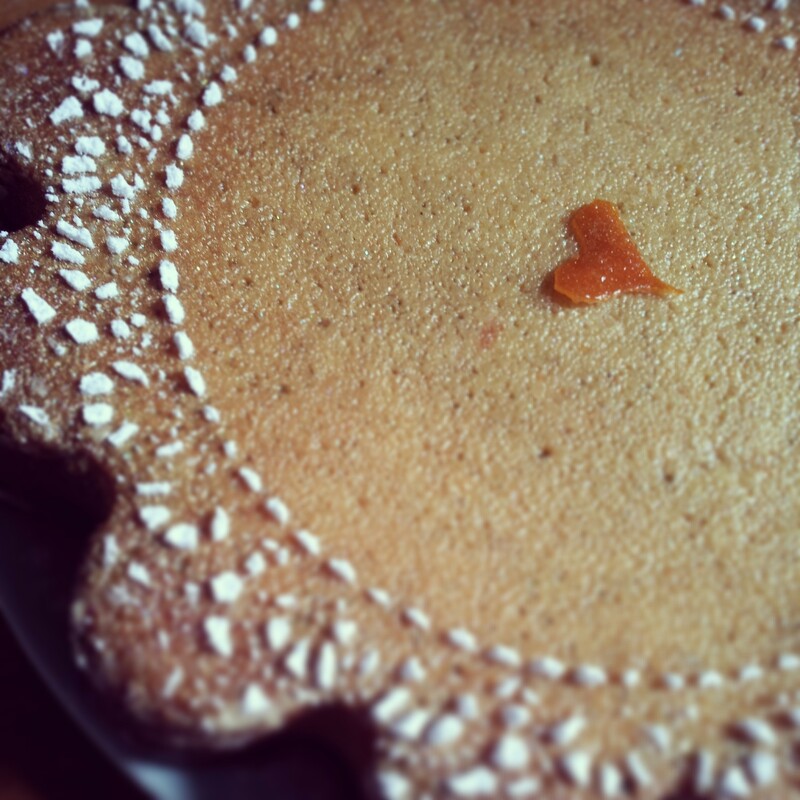 The marzipan and fondant gives you an extra flavour dimension and sweetness. That sugar boost a new mammy needs. Welcome to the World Baby Windsor. Apply flowers, lustre and pearls! Present to your new parent friends. 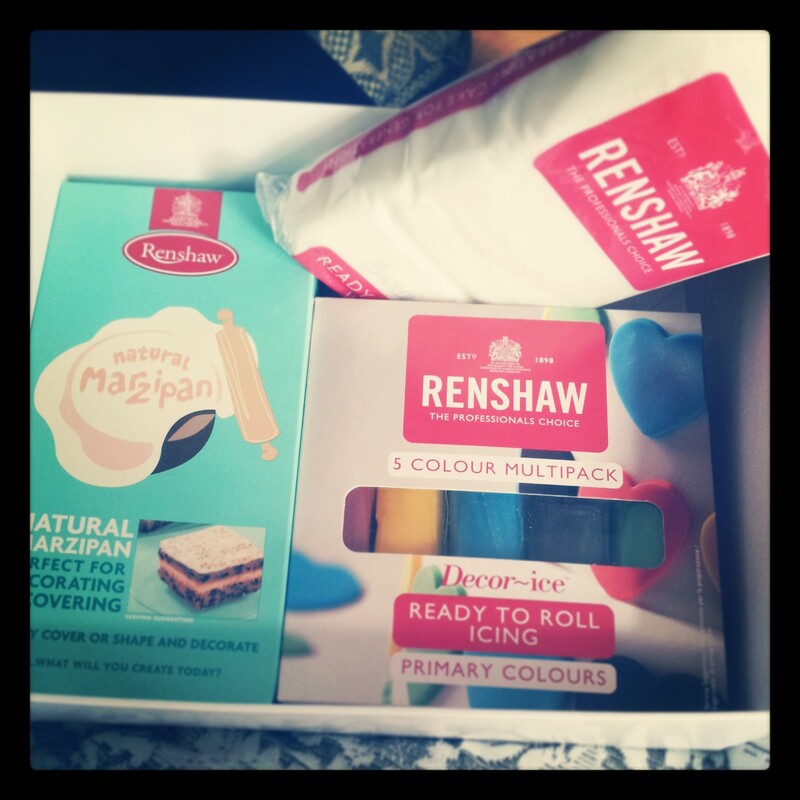 Thank you to Renshaw for sending me this lovely box of icing and marzipan. I loved getting creative with the icing and it’s really easy to work with. 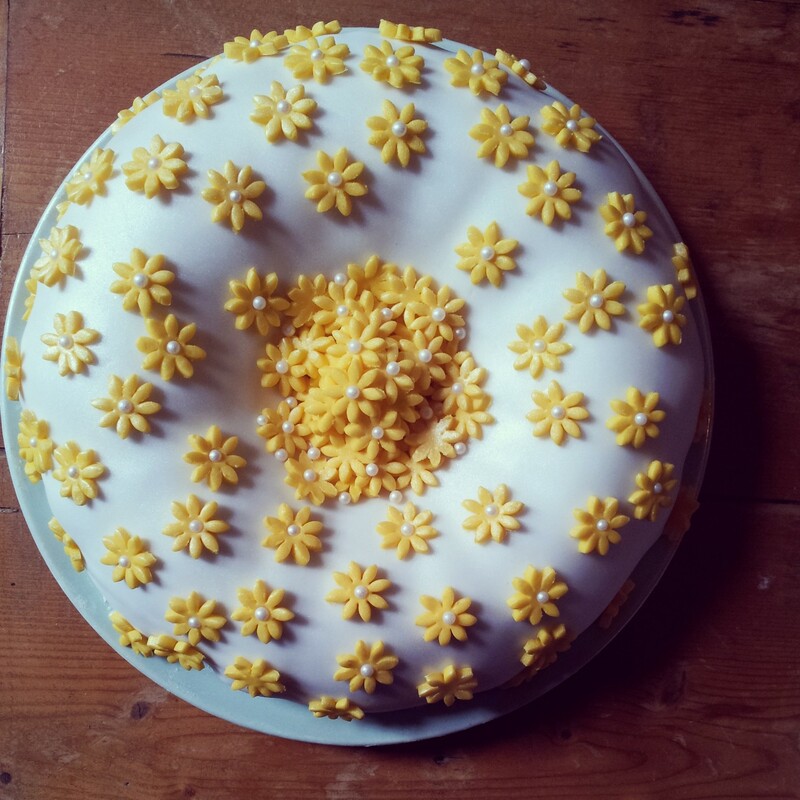 I shall have to practice my cake decorating skills more often! Now who needs a celebration cake?? 48. Oh Canada! 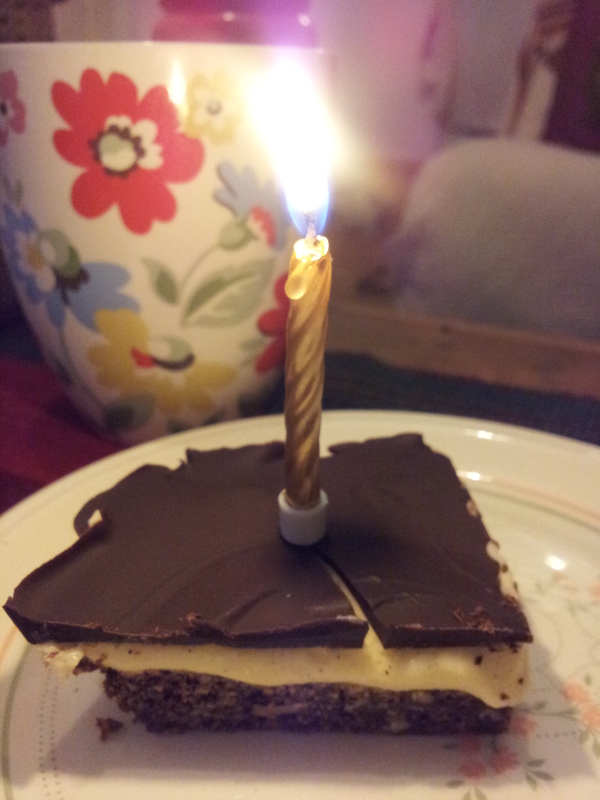 Oh Nanaimo Bars! 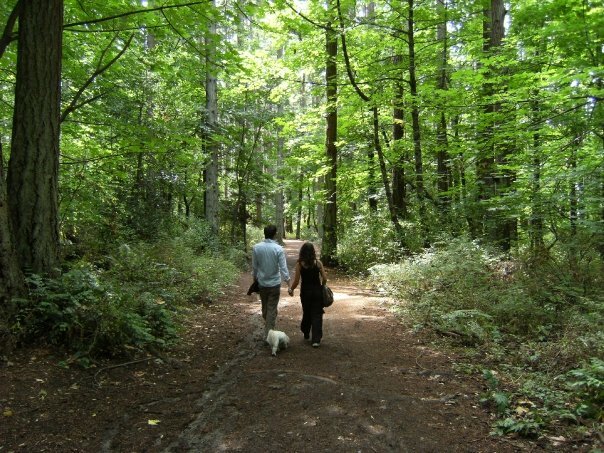 This blog has been a looooong time coming. 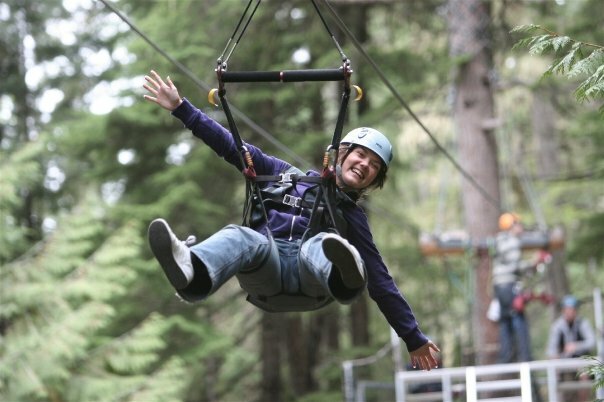 I wanted to recreate a special treat from our Canadian travels for Chris’s birthday (last October…). My Aunty Carol in Canada recommended the quintessentially Canadian Nanaimo bar to satisfy my Canadian cravings. 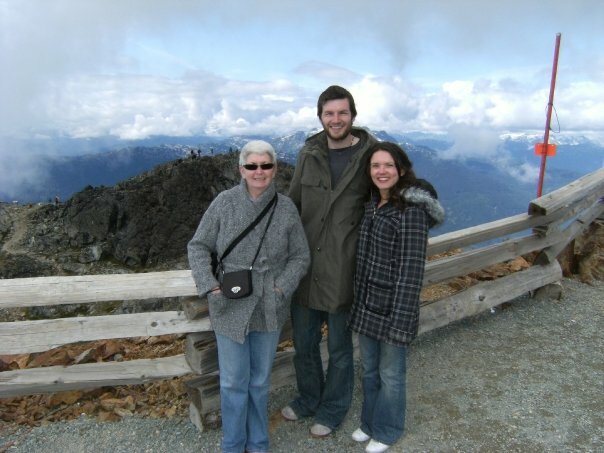 We spent a glorious week with my family on Vancouver island. 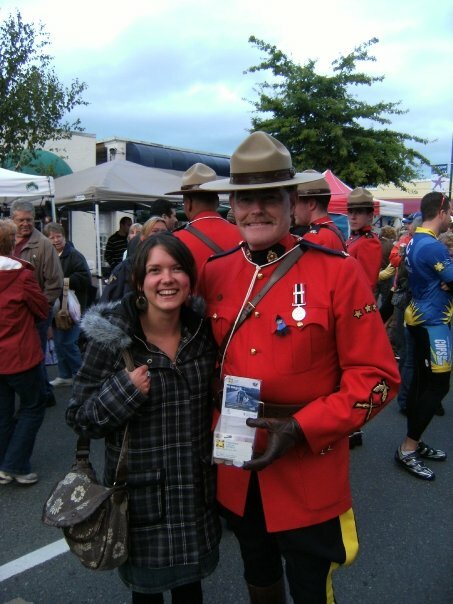 Taking in all the sites, hiking up Mount Doug, whale watching, exploring the ski slopes and of course meeting a Mountie or two. 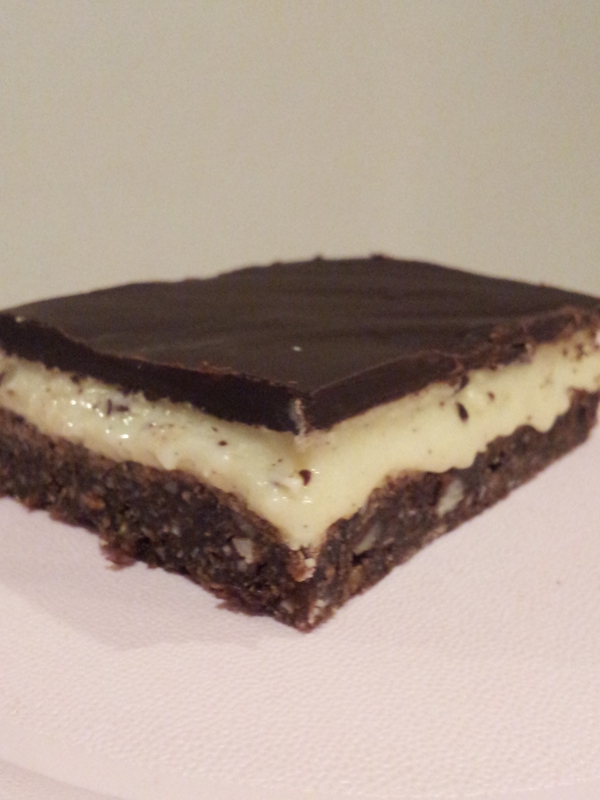 Nanaimo bars are as popular in Canada as Tim Horton’s coffee shop. I still dream of those bear claw doughnuts. 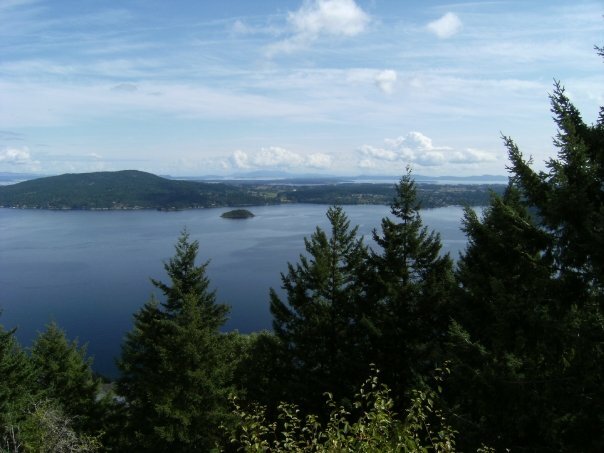 Unfortunately in England we don’t seem to know what Graham Crackers are or sell them in any shops… and they are an essential ingredient in Nanaimo Bars. 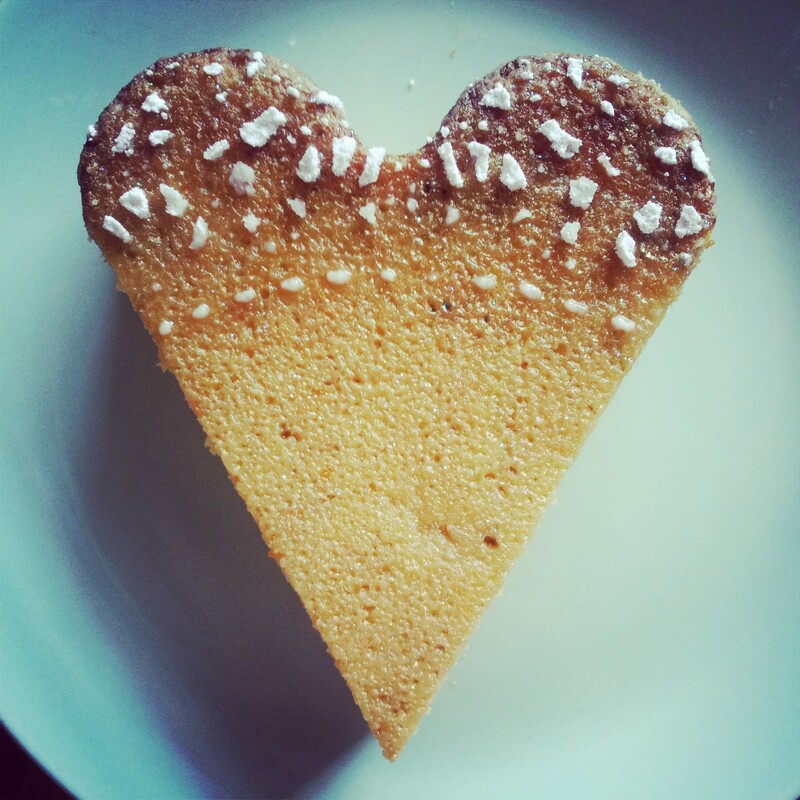 My educated guess is that it’s some sort of spiced caramelised rich tea biscuit. So I did what I do best with limited store cupboard. I improvised. 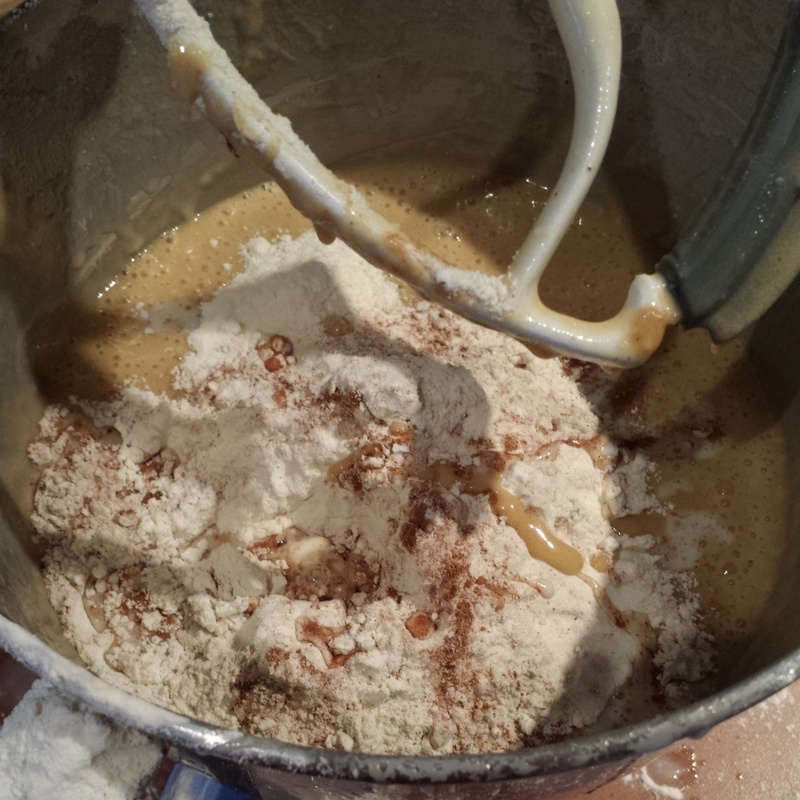 Smashing up a load of rich tea biscuits and adding in a combination of ginger and cinnamon to the mix. 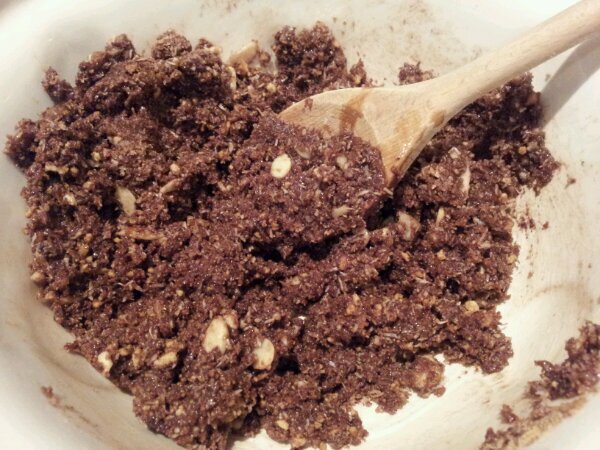 The base required a tasty combination of biscuits, melted butter, sugar, egg, cocoa powder, almonds, and coconut. It’s really quick to mix it all together. A 20 second blast in the microwave is all the butter needs to be fully runny. 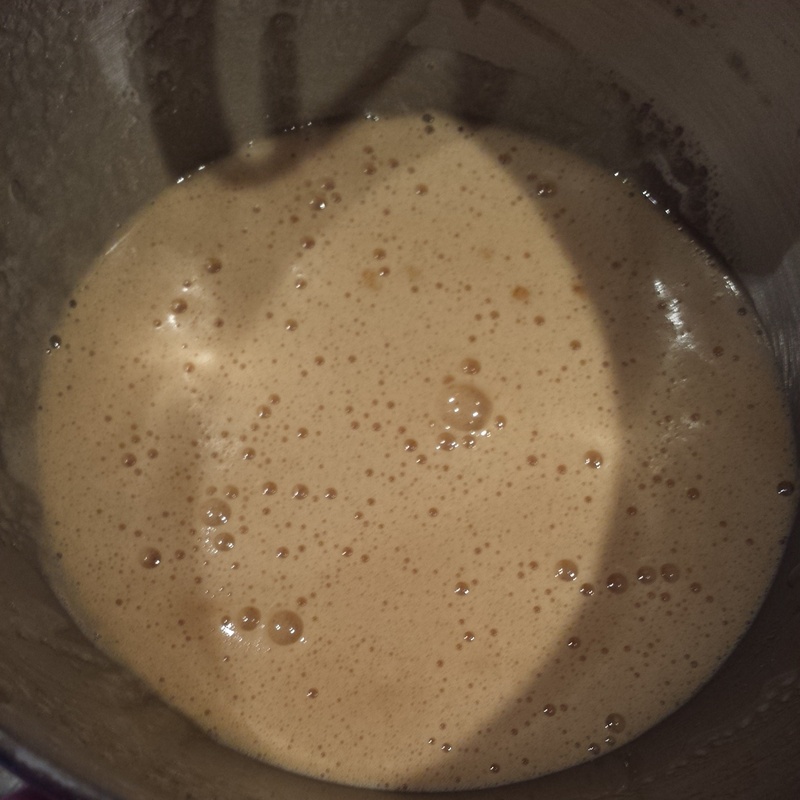 Stir it all together until fully combined and comes together into a stiff mixture. 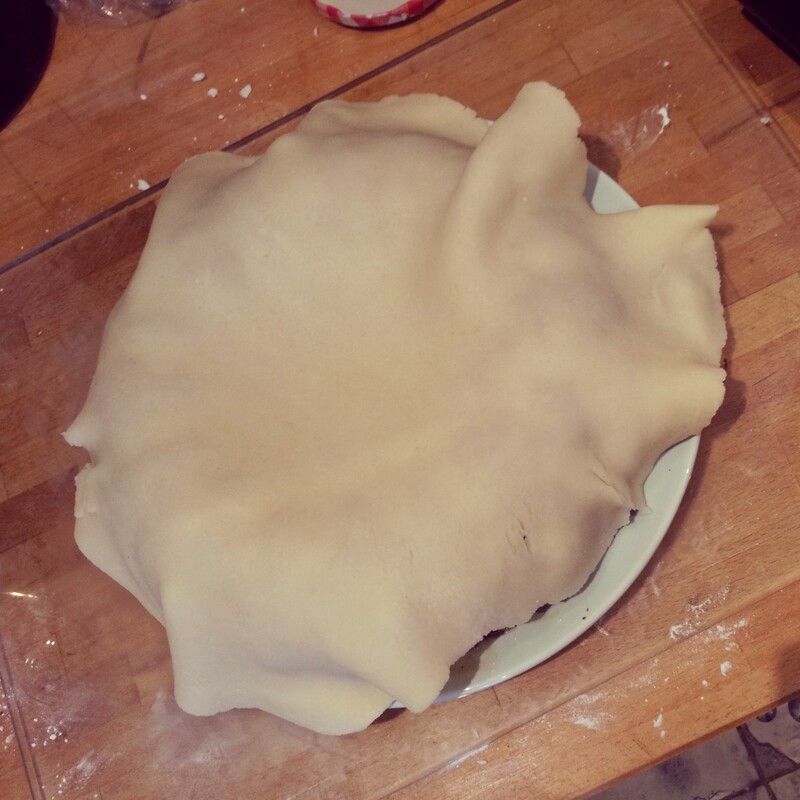 Once combined press the mixture firmly and evenly into all of the corners of a flat lined and greased 9 inch baking tray. Bake the biscuit base in the oven for about 10 minutes at 180 degrees C.
The next decadent layer is a lovely custard cream. 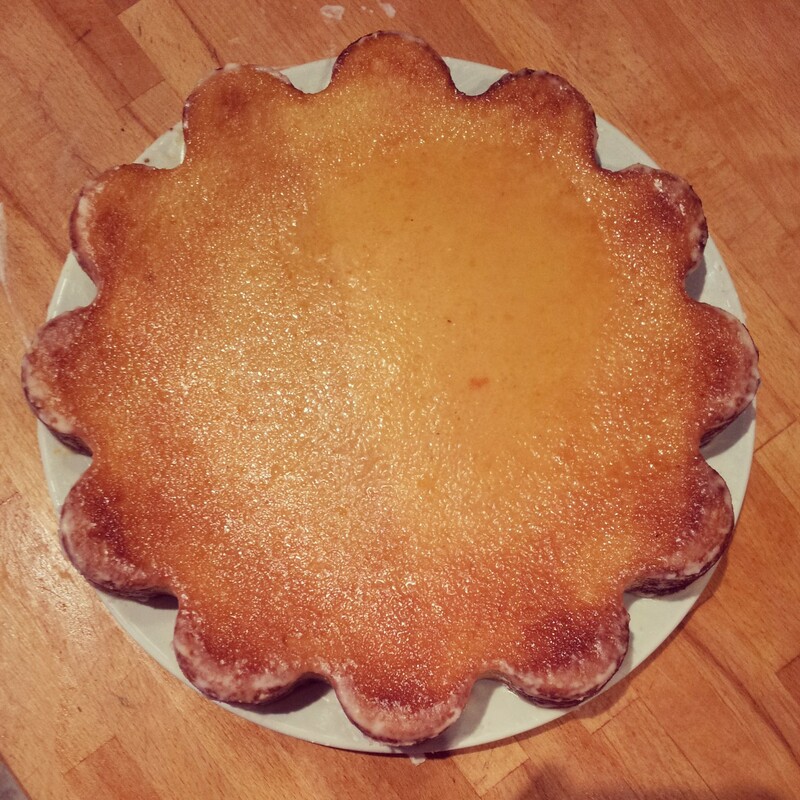 At this point in my baking repertoire I was still yet to attempt custard concocting. Daunted yet undeterred I proceeded to my cupboard to retrieve the custard powder the recipe requires. Disaster struck when I discovered the custard powder was over a year out of date! Not wanting to poison Chris on his birthday I decided I had gone too far and didn’t have time to make another cake so I would have to proceed and whip up my own custard instead. I decided a full custard recipe would be far too much for a small Nanaimo bar recipe so I adapted a Mary Berry recipe to make up my own sweet filling. 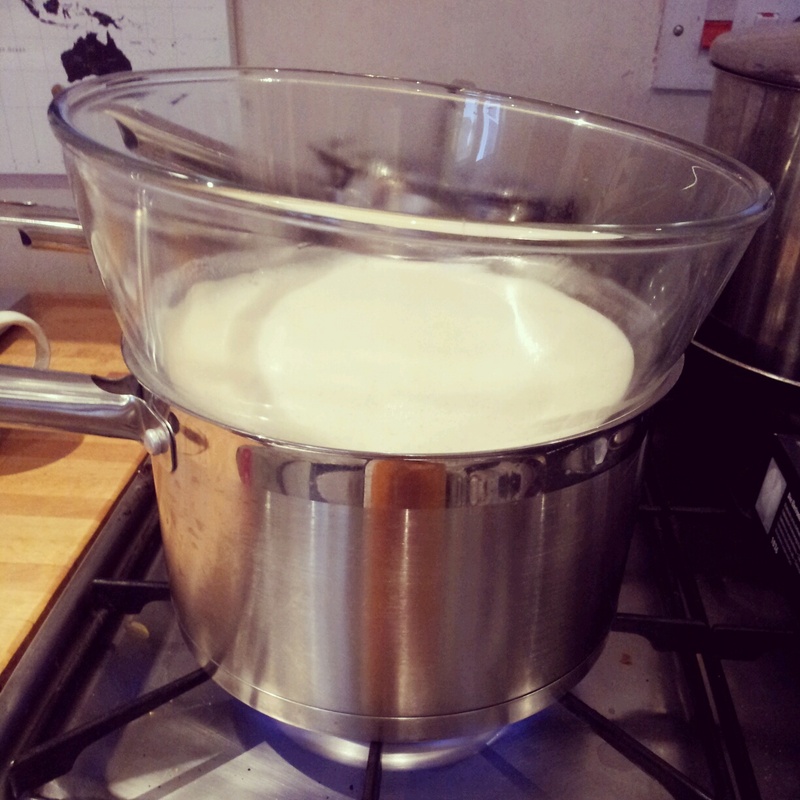 As with gelato or ice cream you start off heating the cream and milk with a vanilla pod to infuse the custard. 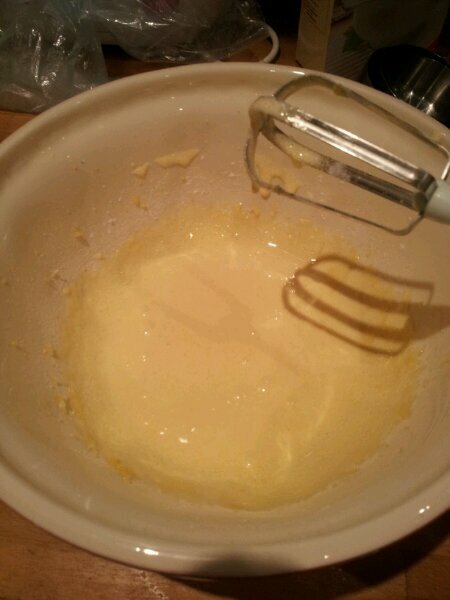 Then you whisk the eggs until fluffy with the sugar. Taking the cream off the heat and pour over the eggs. 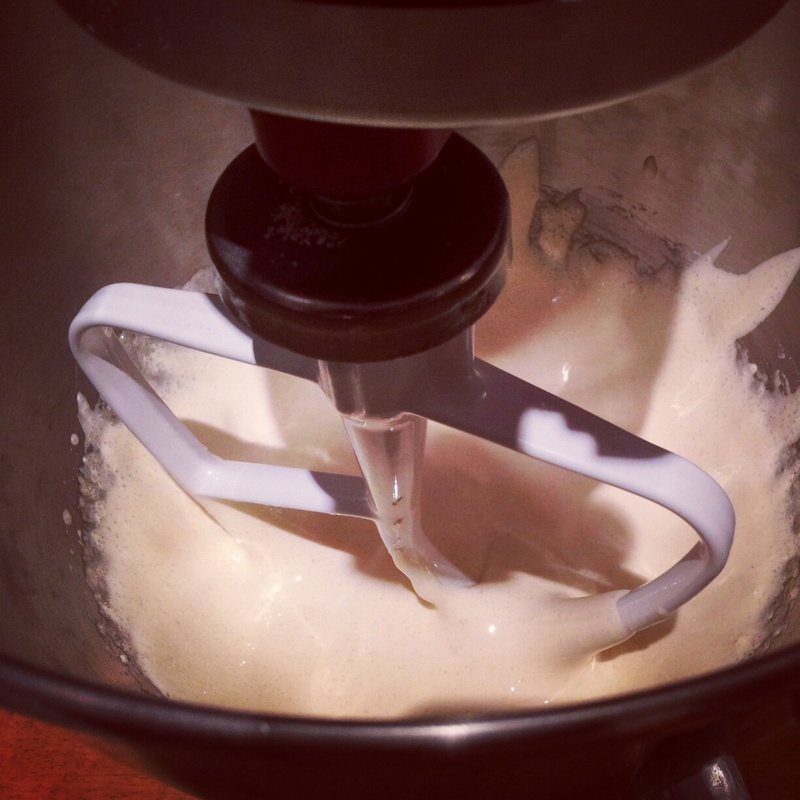 Continue to whisk until it thickens. 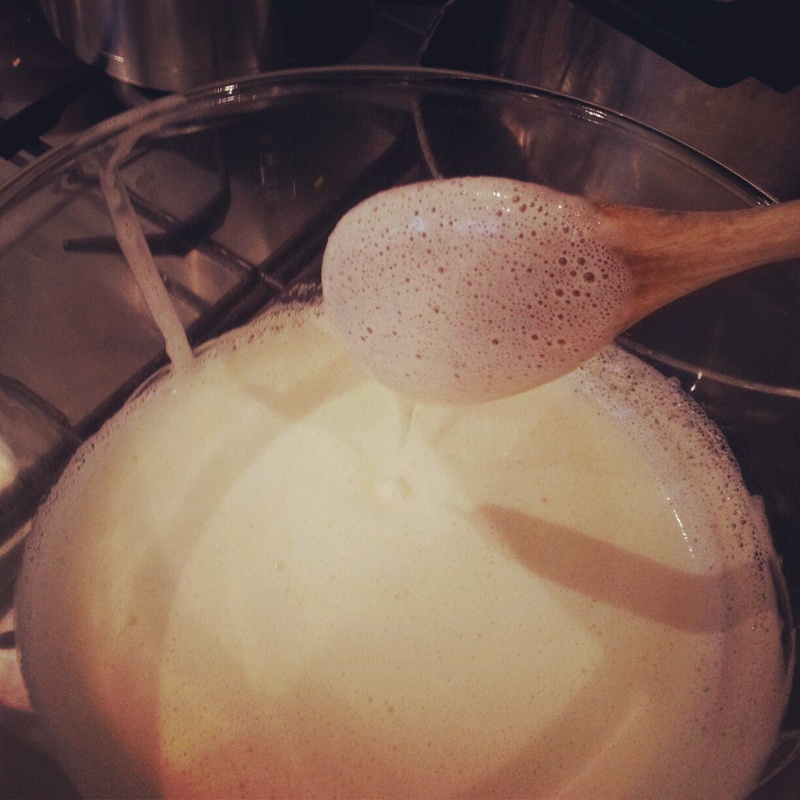 Then return the custard to the pan and whisk over a low heat until it thickens. 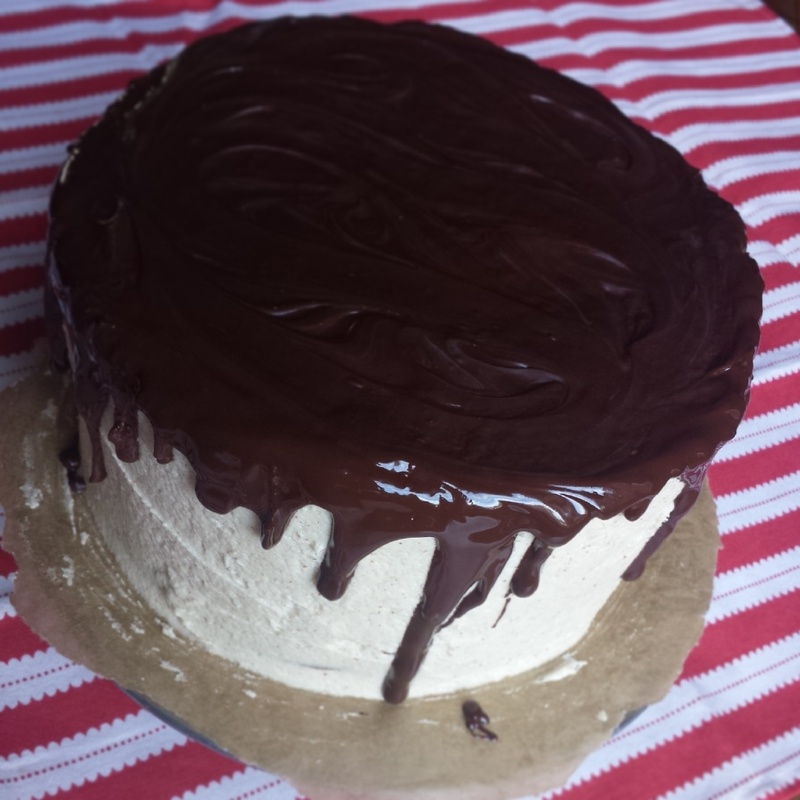 The Nanaimo bar is quite a firm cake so I knew I would have to adapt the rather runny custard to make this work. I added the butter, vanilla extract and a lot of powdered (icing) sugar to the custard. Continuing to whisk it over the low heat until it reached the right thick consistency. 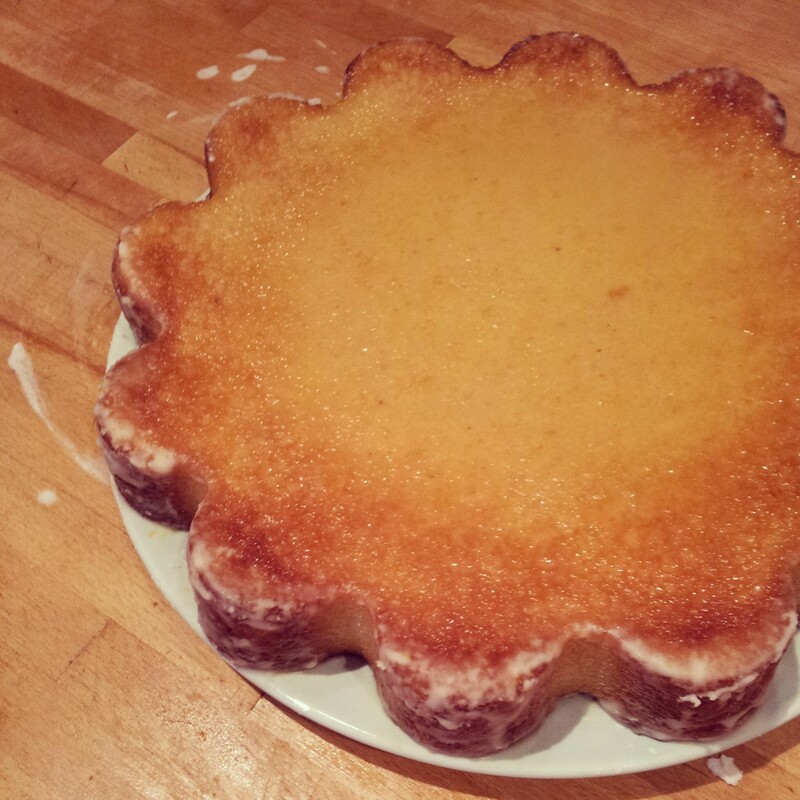 You may need to add more powdered sugar to make your custard set firmly. 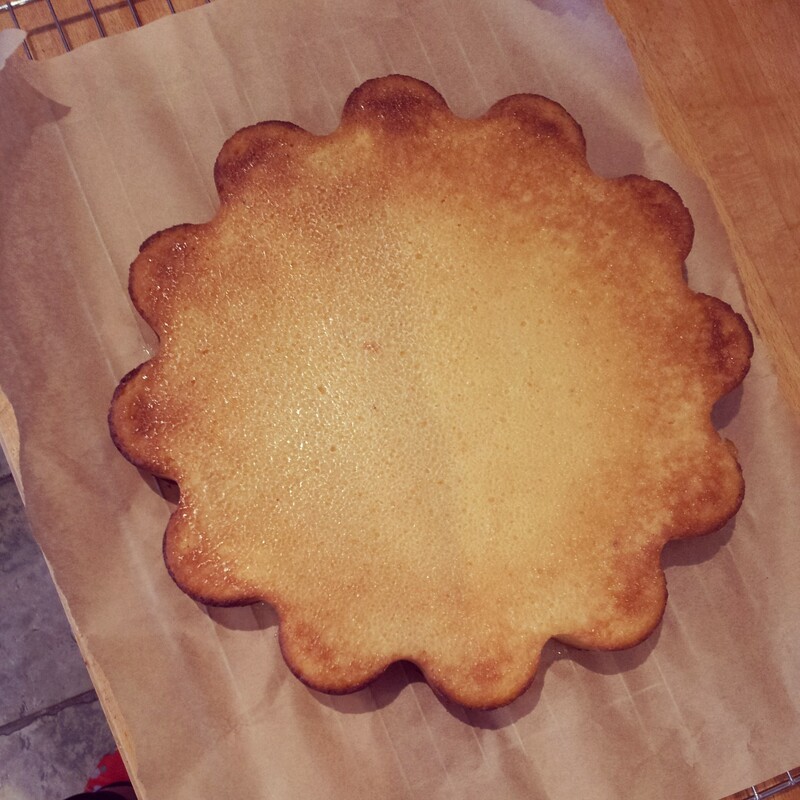 It will end up a much paler custard due to the white icing sugar. 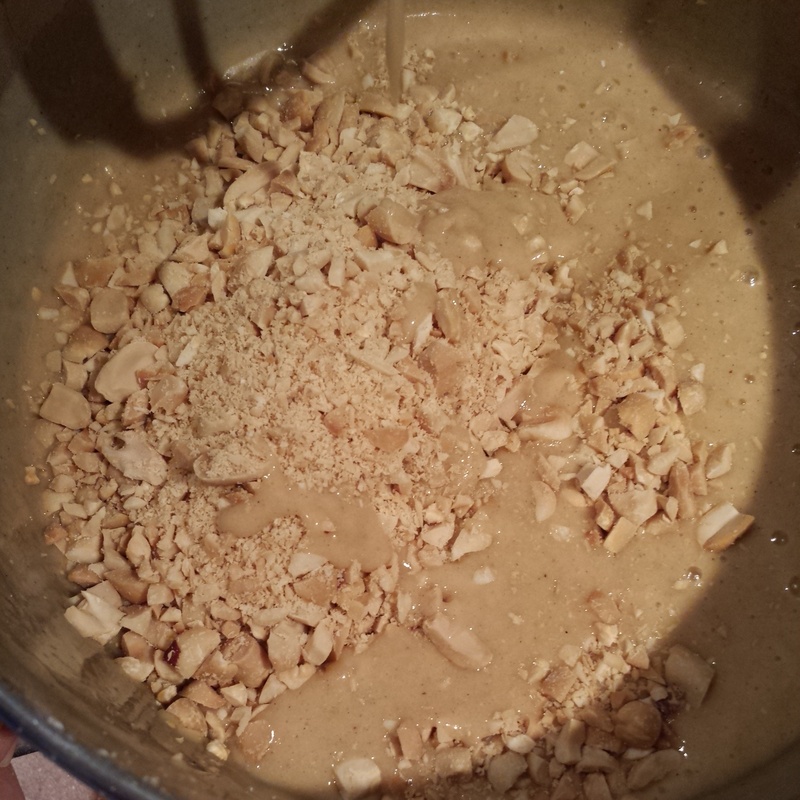 The baked biscuit base – look at those nuts! Take the biscuit base out of the oven and let it cool fully. Once the custard has cooled you can then happily pour the custard over the biscuit and let it set in the fridge whilst you whip up the chocolate topping. Using a bain marie, pop the chocolate in a bowl suspended over a bowl of boiling water to allow the chocolate to melt gently. Save the last third of the chocolate back to add to the melted chocolate to help reduce the temperature of the chocolate. This tempering of the chocolate stops it from blooming or sweating when it’s cooling. It helps to keep your fingers slightly less sticky. 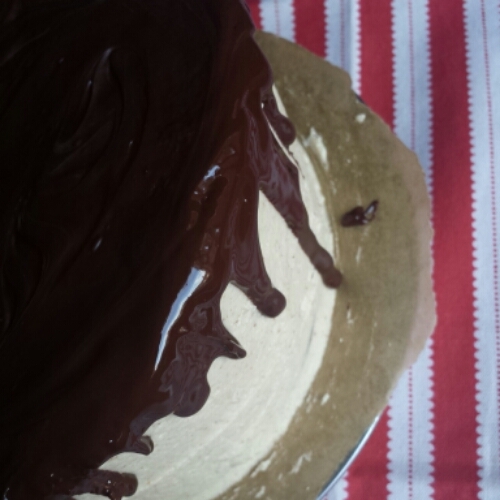 Pour the glossy melted chocolate all over the custard layer and simply let it cool and set. 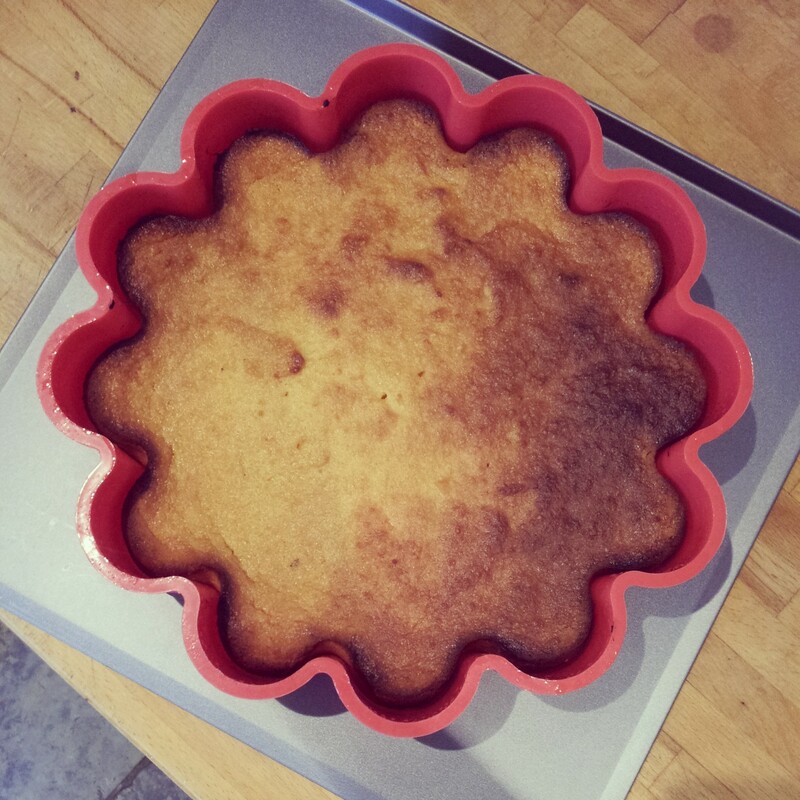 Then once it’s fully set you can take it out of the tin, chop it up and tuck in! I served Chris his for a special birthday breakfast. In hindsight it might not be the best breakfast food, but you can eat whatever you like on your birthday. That’s the rules. It’s a wonderfully sweet treat. 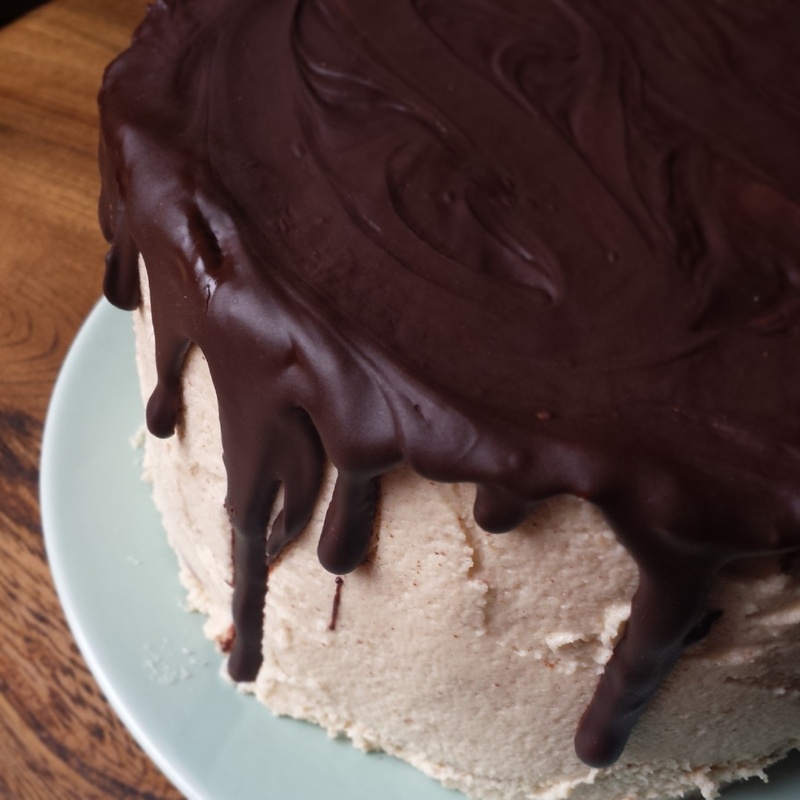 The coconut, custard and chocolate are a brilliant combination. 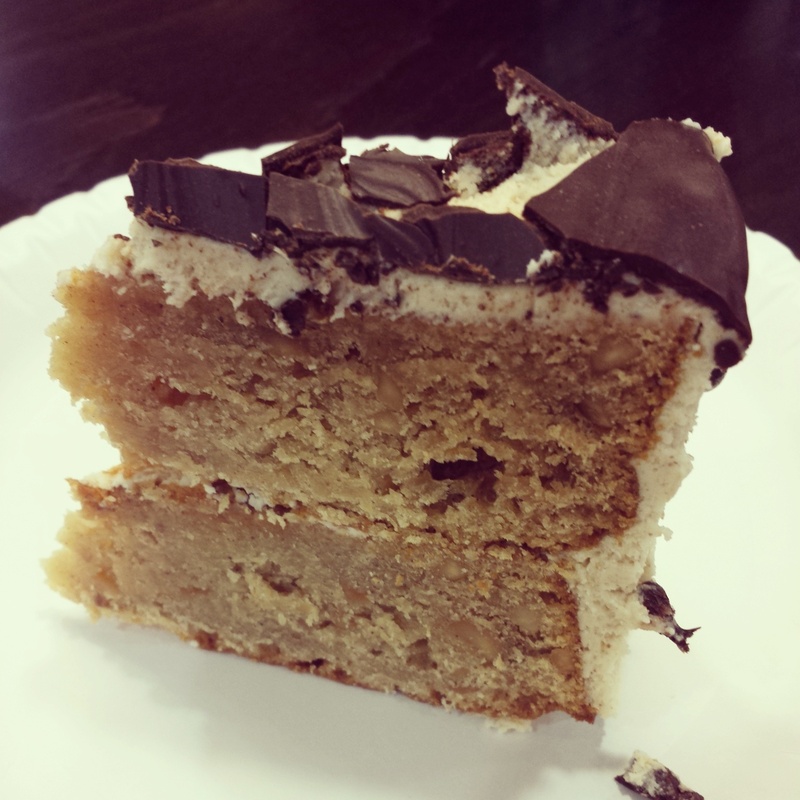 That’s 3 of my most favourite ingredients all wrapped up into one cake. And even better, it doesn’t take an age to make. I can see why the Canadians love it so. 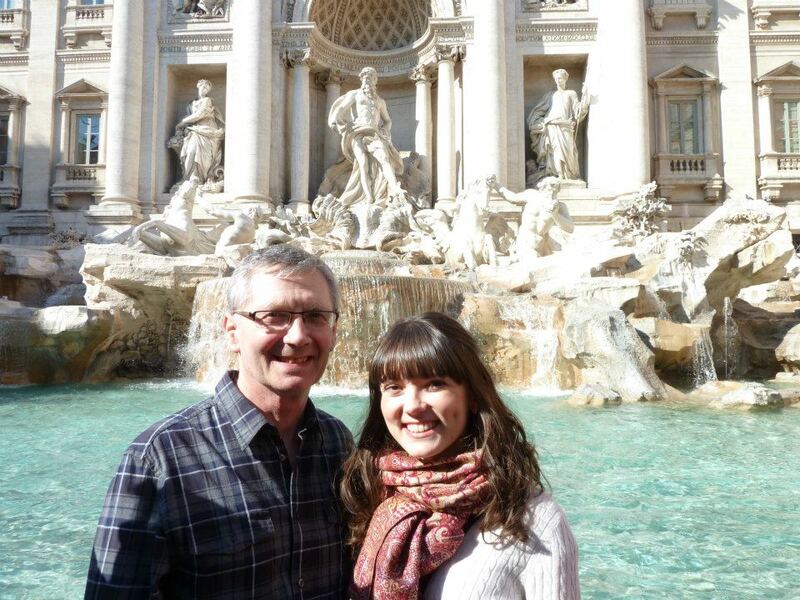 Thank you so much for the wonderful memories and for showing us the sights Aunty Carol, Uncle Malcolm , Kelly and David! 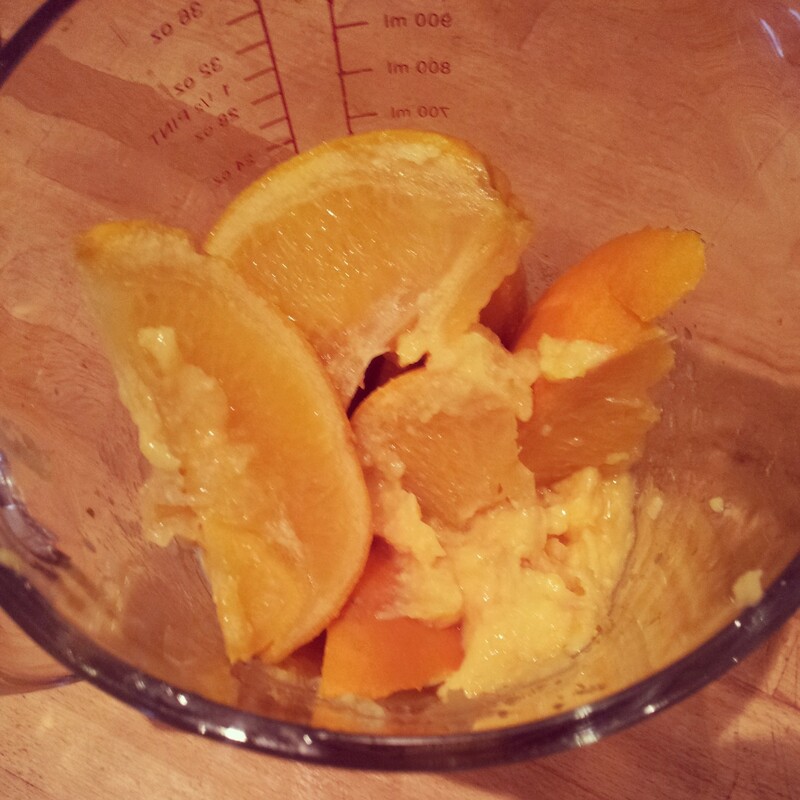 *Or alternatively use 2tbsp custard powder if you have it! 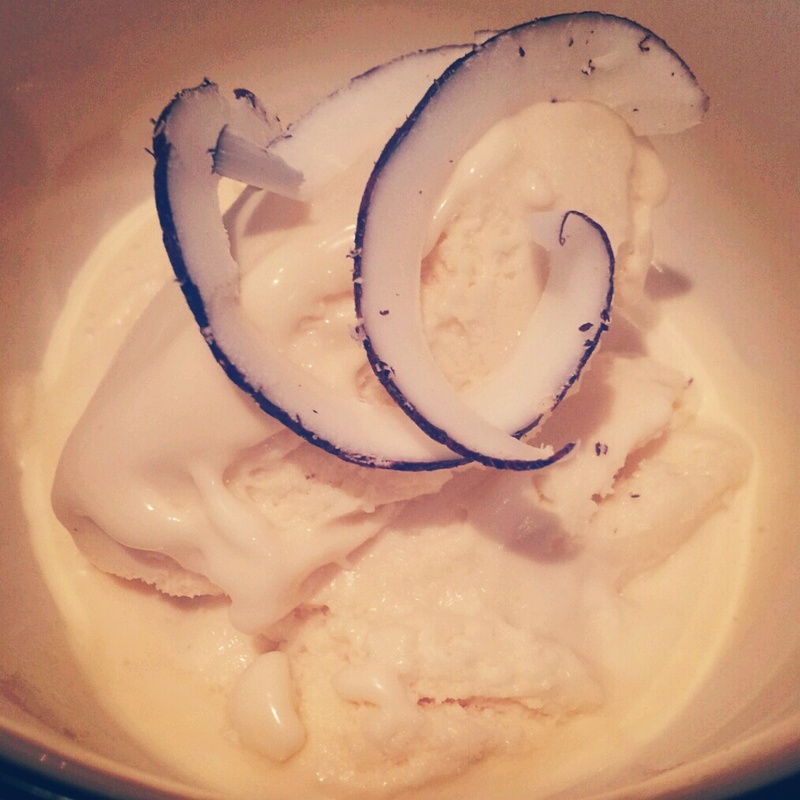 My favourite ice cream in the whole entire world has got to be Italian Coconut Gelato. Now that’s a bold statement I know, but having sampled real Italian Gelato and having lived very close to a Gelato shop in Newcastle I think I’ve tried quite a few flavours and this is without doubt top of my list every time. Yeah chocolate is always lovely but a bit too much of an obvious choice sometimes for my liking. I do love cherry gelato and pistachio is tremendous too but coconut is what is usually what I crave when looking for a cold fix. The main difference between ice cream and gelato is the taste and texture. Gelato freezes at a higher temperature than ice cream. This gives a much more intense flavour than you get from eating ice cream which is colder and numbs your tastes buds slightly. The warmer the temperature the more you can taste! Gelato is also made with less fat, so good news it’s better for you than ice cream! (Depending on how much you eat of it of course). Gelato is also much softer and smoother in texture than traditional ice cream. All the better for eating! 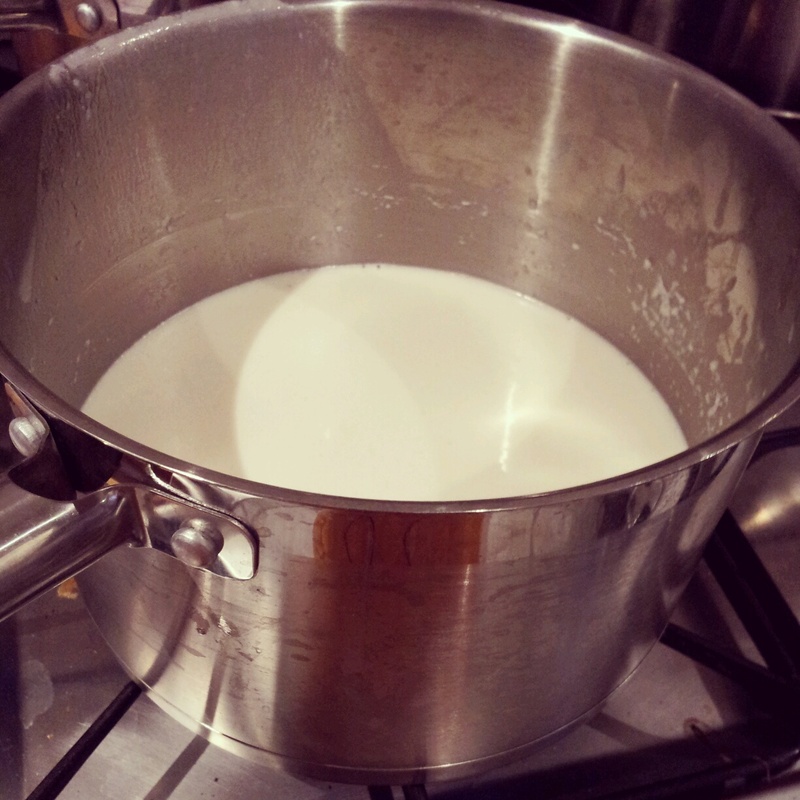 The initial stage of heating the milk/cream gives you the perfect opportunity to infuse flavours. You can choose to infuse whatever flavour you fancy into your gelato. Some flavours will require a longer infusion time than others. A vanilla pod may take about 20 minutes over a low heat to impart it’s flavour fully, but something like coffee extract, tea bags, cocoa powder or other flavour extracts will give instant flavour and need little infusion time (maybe about 5 minutes). You can infuse your base with your favourite flavours, such as vanilla, coffee, tea, lavender, rose, cinnamon, cherry, pistachio and much much more! If you’re going to choose a different flavour it would be wise to choose something with a low liquid content as adding water to the mix may cause ice crystals to form. Adding alcohol in small amounts should be ok, but remember alcohol doesn’t really freeze. Another flavour option can be created by using a different variety of milk. Even better news for people with food allergies or intolerances! I used coconut milk here but you could just as easily use cows, goats, soy, almond or hazelnut. Each will give you a slightly different flavour and possibly texture. Some milks can become grainy when heated, so it may be wise to try heating up a small amount first to make sure it can stand the heat. before you commit to cooking an entire batch. Or have a fine sieve to hand! 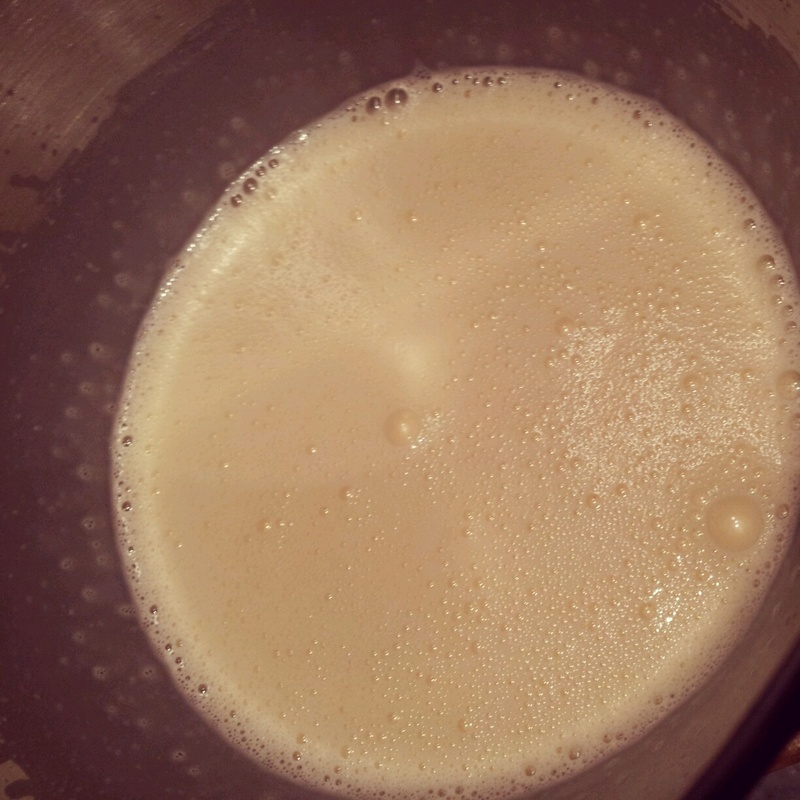 Add your choice of flavour to your milk then heat the cream/milk until it starts to bubble. I added 80g of desiccated coconut to the milk and cream here to infuse even more coconut goodness. Keep stirring it so a skin doesn’t form on the top. Allow it to cool slightly. 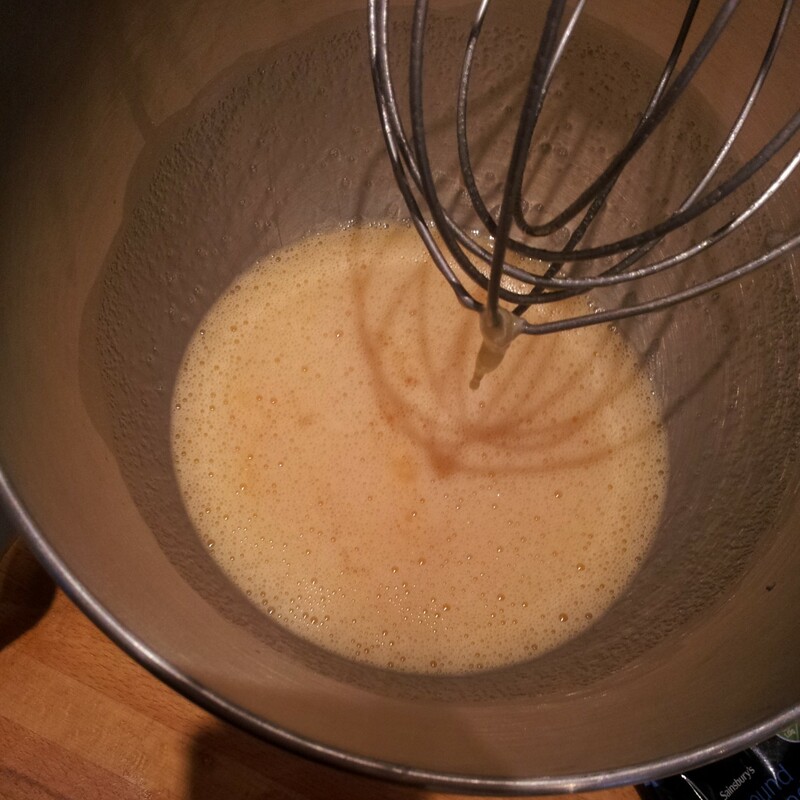 Cream and milk have slightly different boiling points so keep a close eye on the pan, you don’t want it to boil over, or get a thick skin on your coconut cream! Beat together the sugar and eggs until smooth and fluffy. 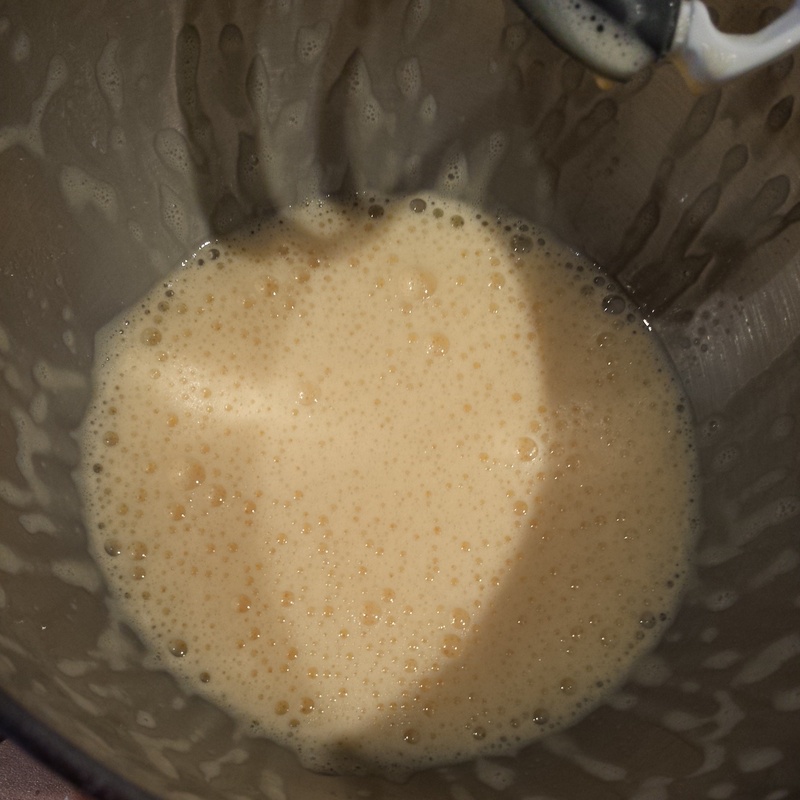 They will become a mellow yellow colour after about 5 minutes of beating with an electric whisk/mixer. 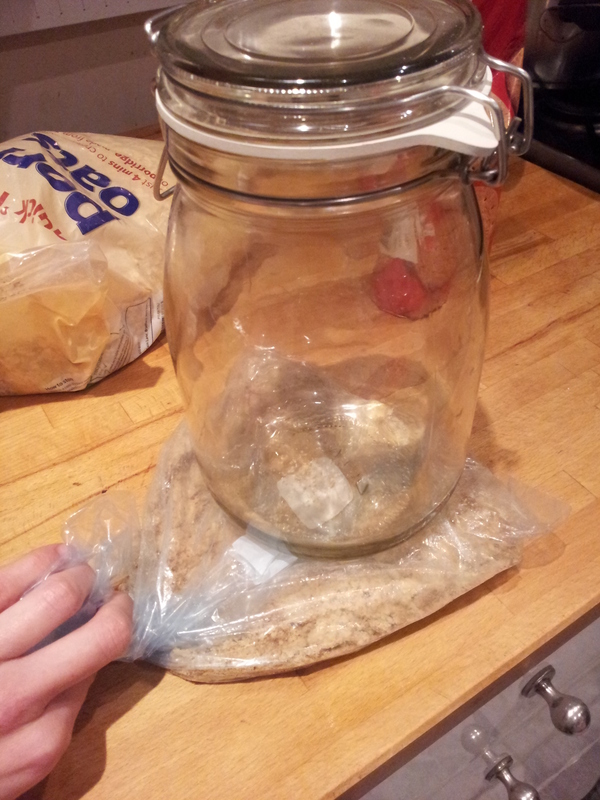 The discarded desiccated coconut – nothing will go to waste in my house! 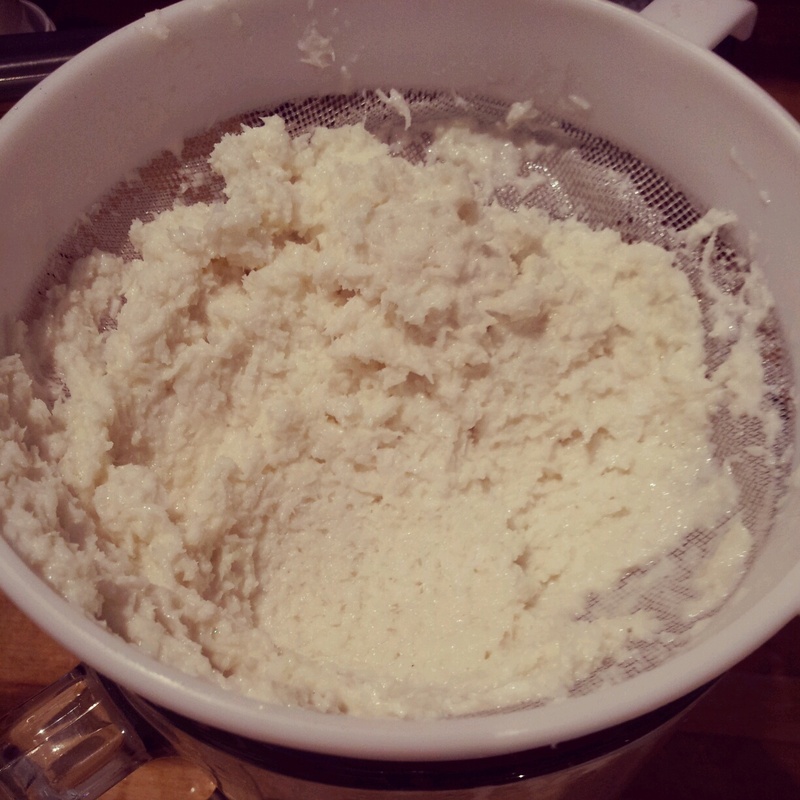 Once the cream/milk has cooled slightly pass it through a fine sieve to remove your flavouring if needed. Squeeze all of you milk/cream out of the coconut so you don’t miss a drop of your infused cream. I kept my creamy coconut mixture to use later on. 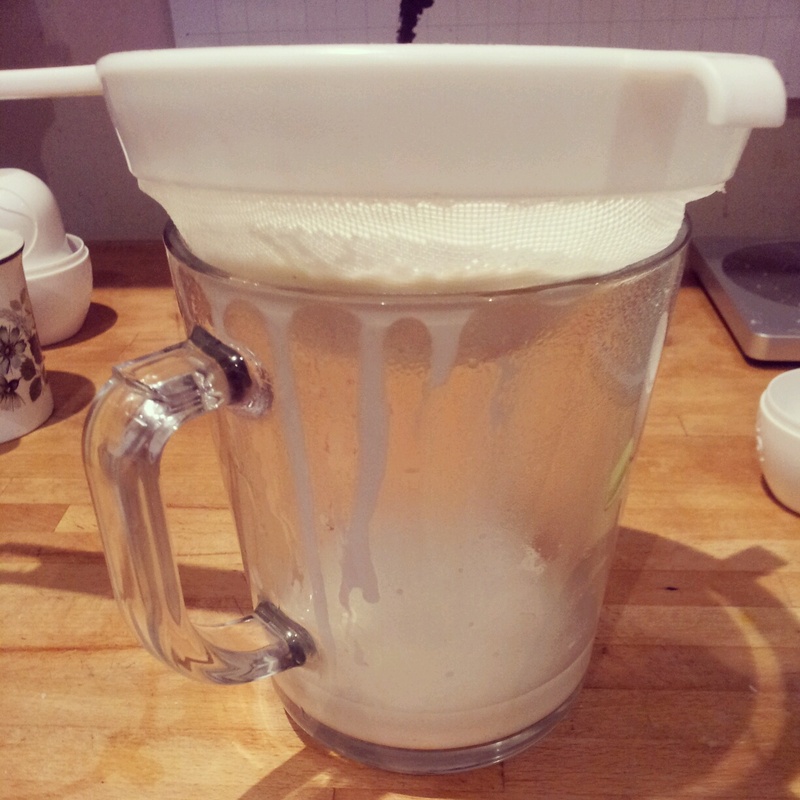 Sieve your hot cream mixture if you need to remove additional flavourings like vanilla pods or dessicated coconut! 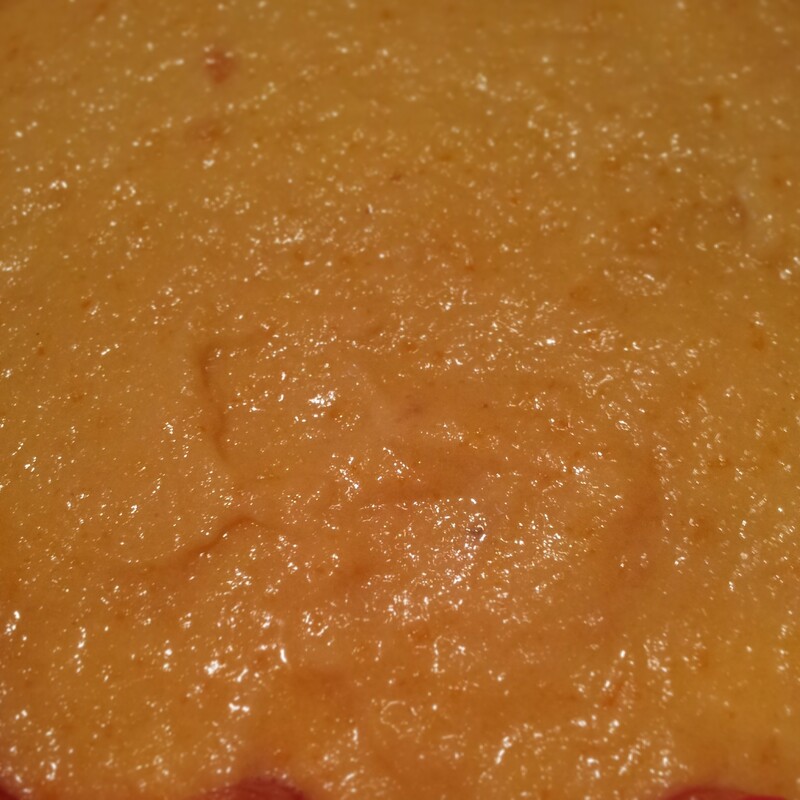 As the next stage is to make a smooth custard you can’t add any swirls of fruit/flavours at this point. 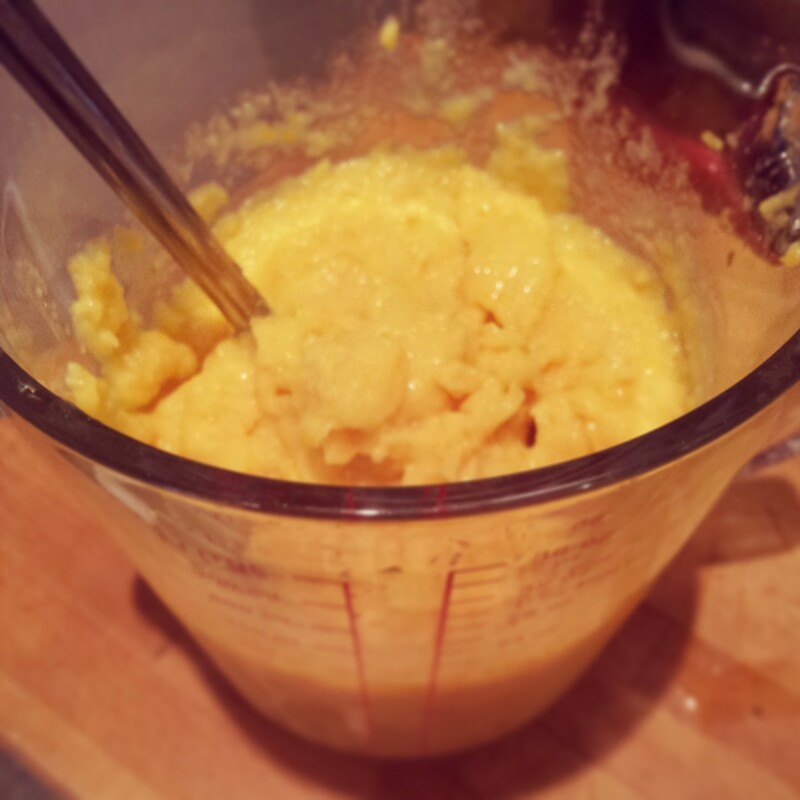 Your custard needs to be smooth and pure so it can thicken fully. Hang on to any additional flavourings that you would like to add for later on. You can then swirl them in just before the final freeze. 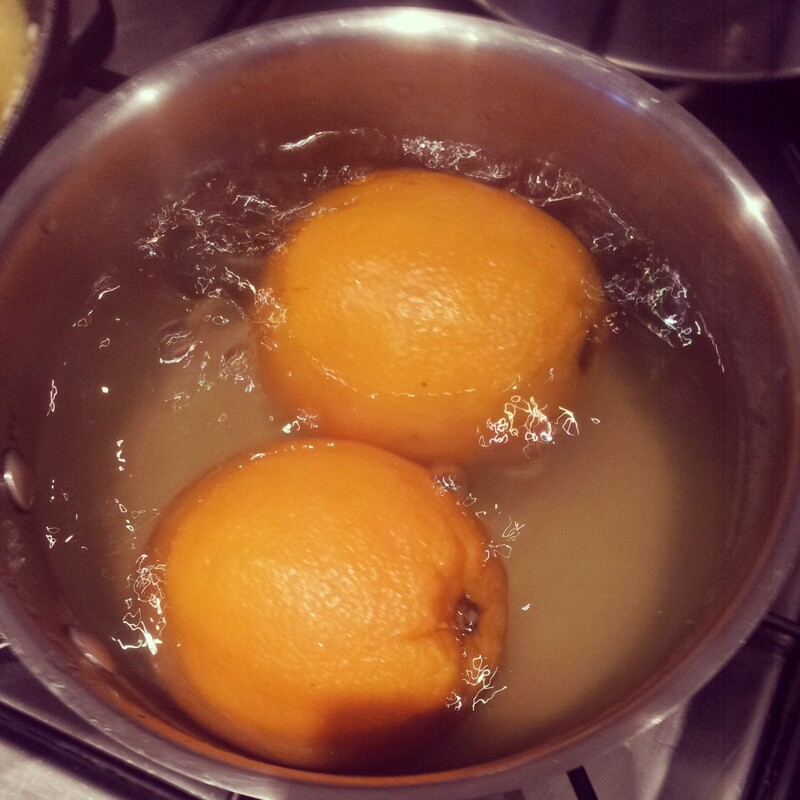 After about 5 minutes of beating, the sugar and eggs will inflate slightly and take on a pale yellow colour. Whilst continuing to beat the fluffy eggs and sugar slowly pour the hot coconut cream into the eggs. Add the hot cream gradually to avoid scrambling the eggs! Adding very hot cream at this stage will give you lumpy egg custard, I don’t think anyone would enjoy lumpy gelato although it may be an interesting texture on the palette! 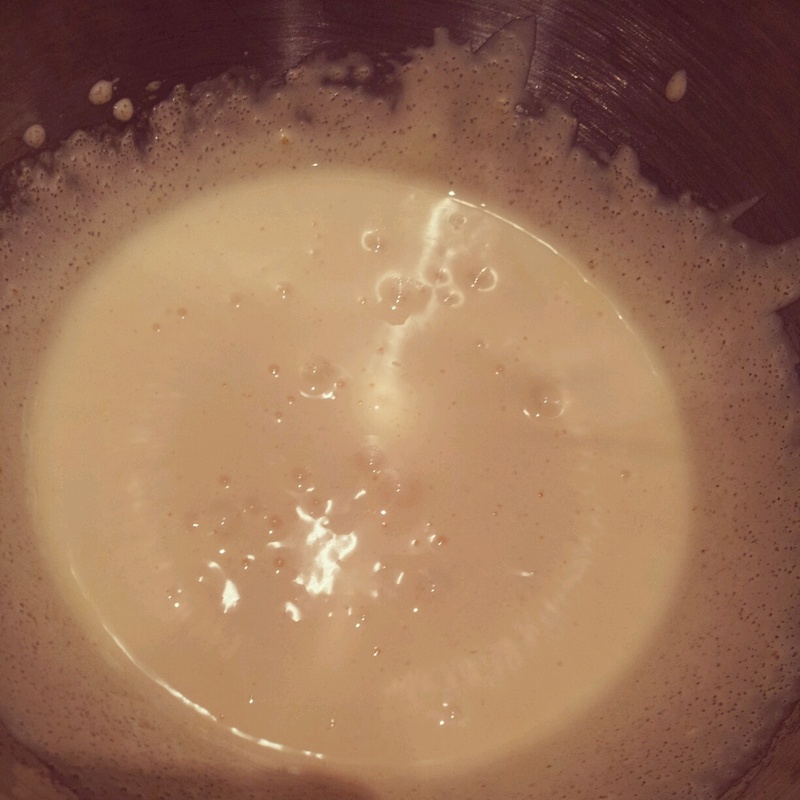 Then all that’s left to do is thicken the custard a bit more. You can do this in a bain marie (in a bowl suspended over a pan of hot water) to avoid burning the custard and gently thicken the mixture. Or if you’re in a hurry, whack it all in a pan and heat the custard over a low heat and stir like mad so nothing burns/sticks to the bottom. 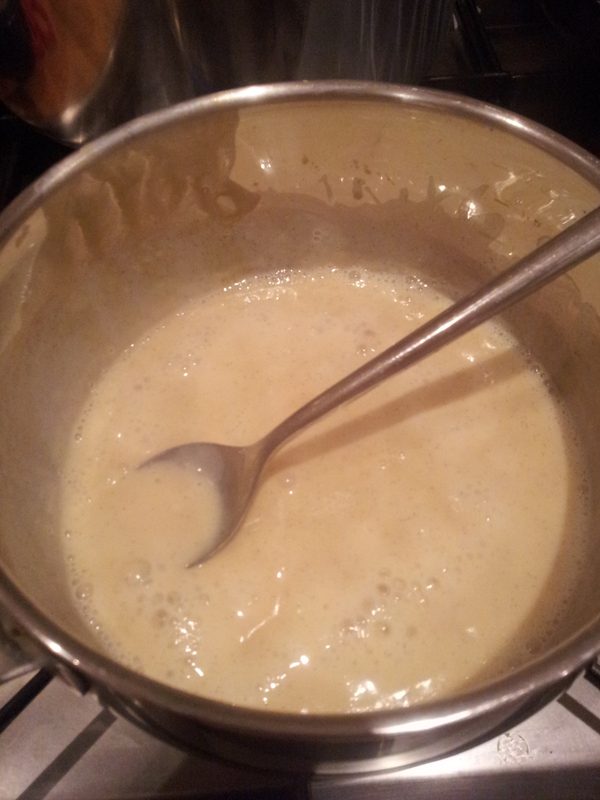 The key is to keep stirring to distribute the heat evenly and allow the custard to cook thoroughly. Once the custard is thick enough to coat the back of a spoon it’s good to go! 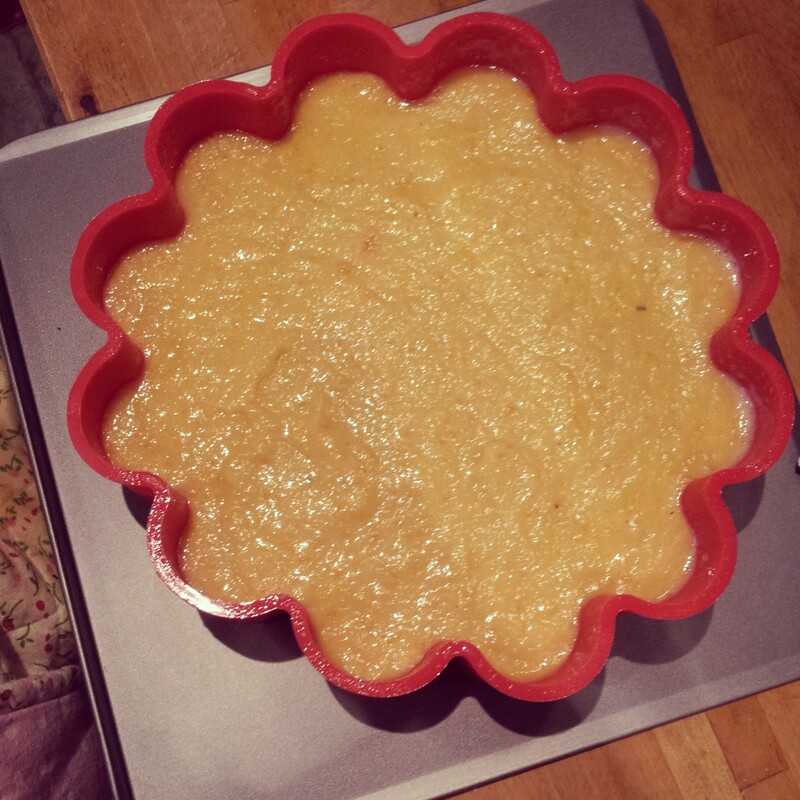 The custard needs to cool before you can freeze it and unfortunately this can take up to 6 hours…. Not great when you need a gelato fix right this second! A quick cheat is to carefully place your hot pan of custard into a bowl (or in my case a sink) of cold water to rapidly cool the custard. Keep stirring it every now and then to stop a skin from forming. You can chill it further in the fridge before cracking out the ice cream maker. 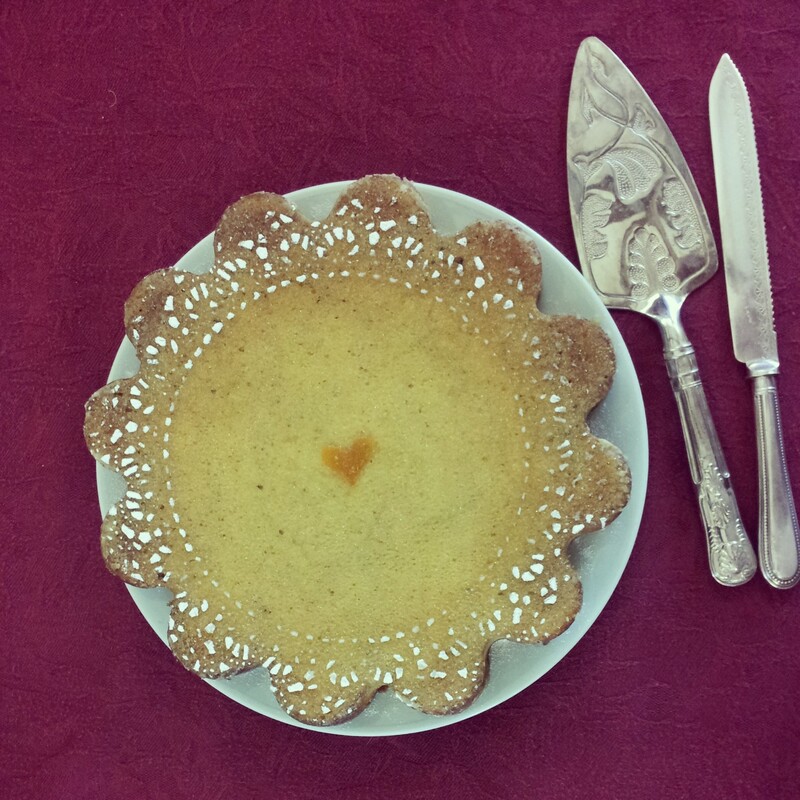 Coconut Custard coating the back of a spoon – thick enough to cool! After all this patience the end result is not far off! I recently bought myself an attachment for my Kitchenaid mixer. The ice cream maker! 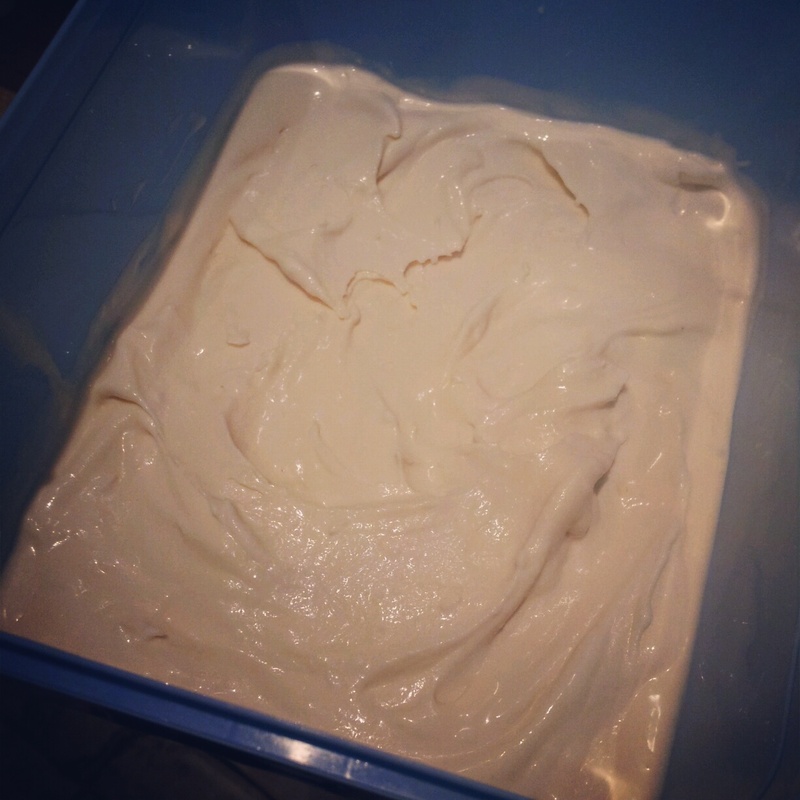 This was my very first experiment and venture into ice cream making. You will need to follow the instructions for your own ice cream maker as they’re all a bit different, but for the Kitchenaid, I had to freeze the special ice cream bowl in the freezer for 15 hours (it now lives there permanently for all ice cream making emergencies) . Once I had fitted the blade to the Kitchenaid mechanism it’s good to go. 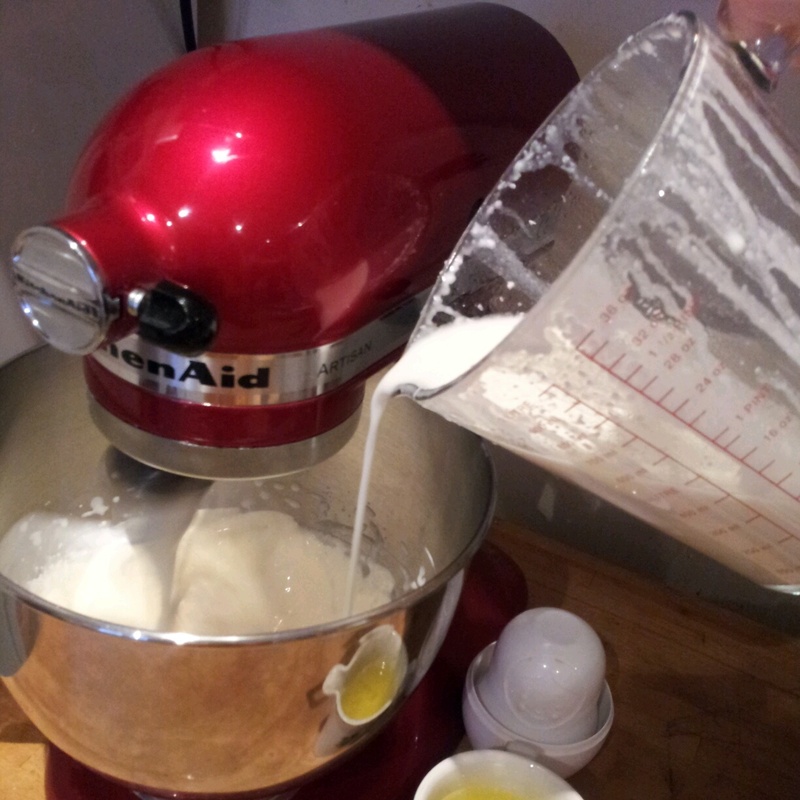 One important thing to note is that you should pour the custard in whilst the machine is running as the custard may freeze solid instantly and could break your Kitchenaid if you’re unlucky. 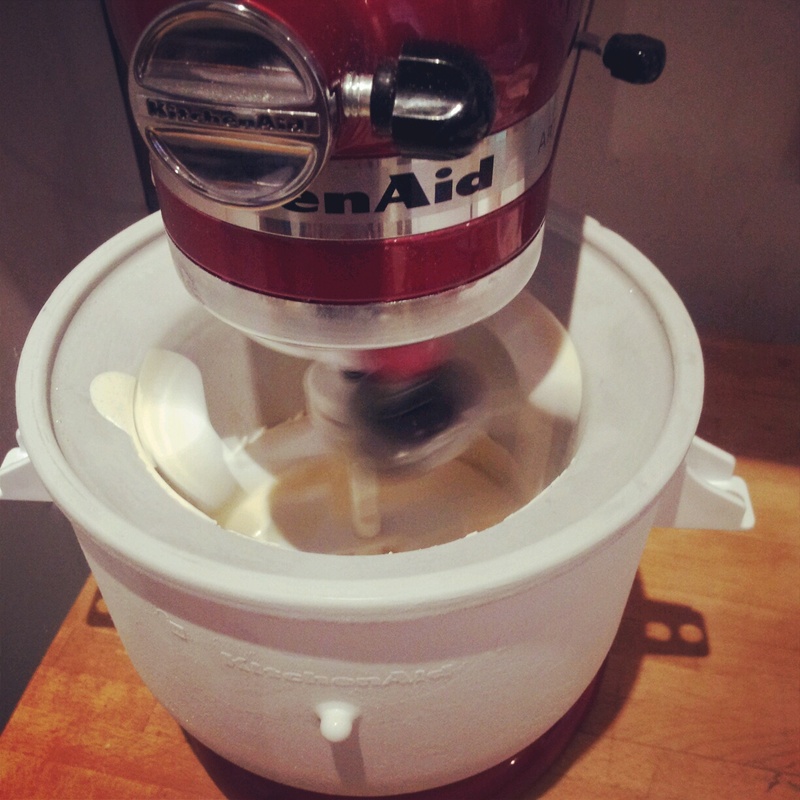 It takes about 20 minutes in the Kitchenaid to freeze the gelato to a ‘soft set’ . I couldn’t resist a sneaky taste of it at this stage and it tasted pretty amazing. It will be quite sweet at this stage as when it’s set further in the freezer the sweetness is reduced. So with 20 minutes on your hands you’ve got plenty time to have a cup of tea and start the washing up. 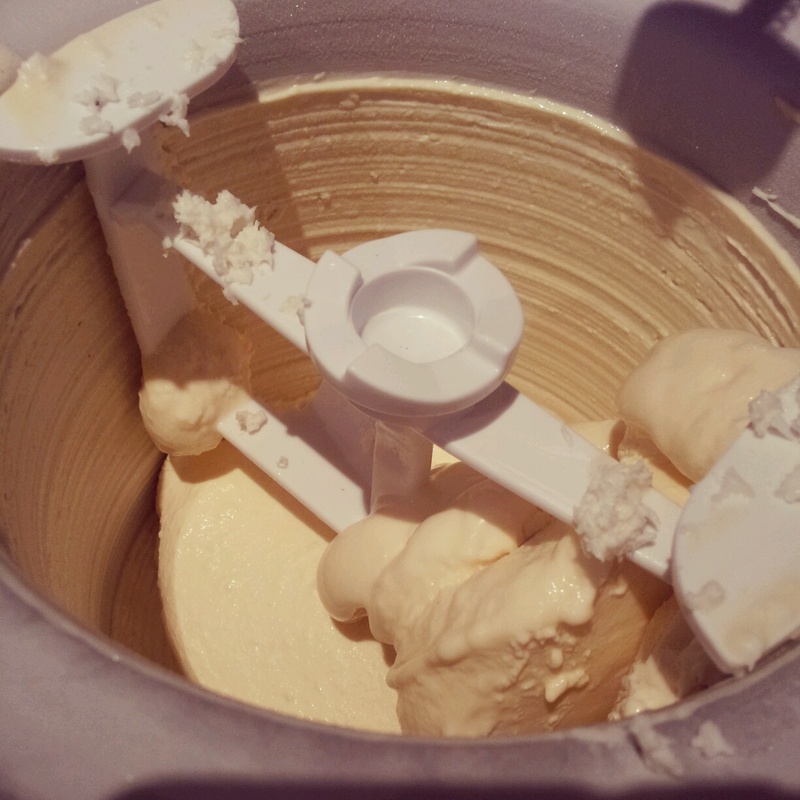 Once the gelato has reached the ‘soft set stage’ where it starts looking like slightly melted/soft ice cream you can stir in any additional flavours. I added 2 tablespoons of the left over desiccated coconut for good measure. You can see some of it lurking on the top of the blades! You could probably eat it at the soft set stage if you like your gelato extra soft, or scoop it into a freezer container, smooth it down and leave it in the freezer to set fully for about 5 hours. As Gelato contains less fat it freezes much harder than ice cream, so you may need to take it out of the freezer to soften before serving. 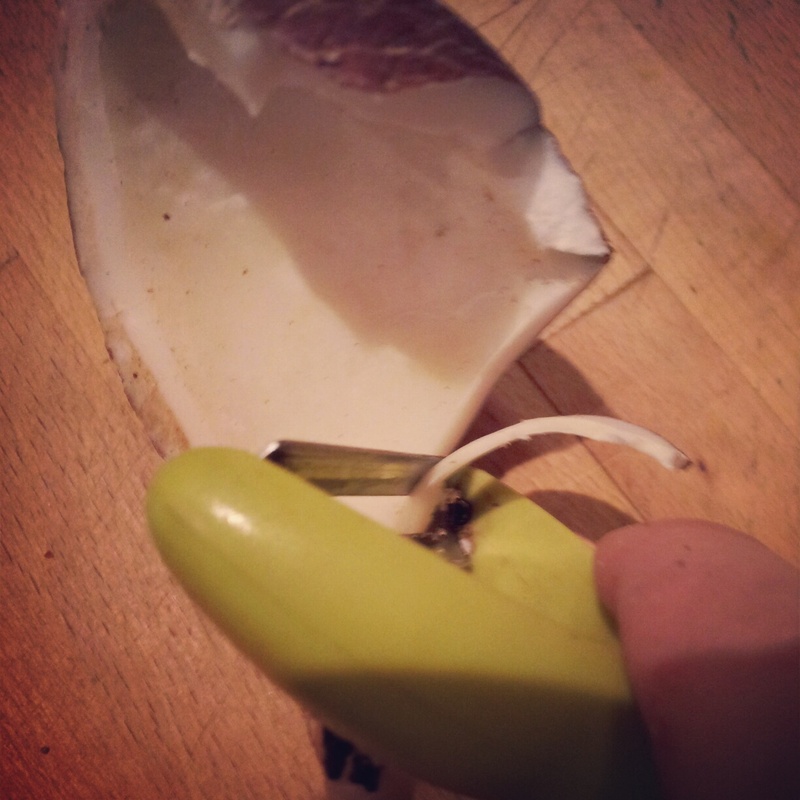 You could pop it in the fridge for 15 minutes if it’s a bit difficult to get it into a bowl. Taking my trusty vegetable peeler I shaved the dried coconut halves into thin slivers to create some pretty coconut curls. 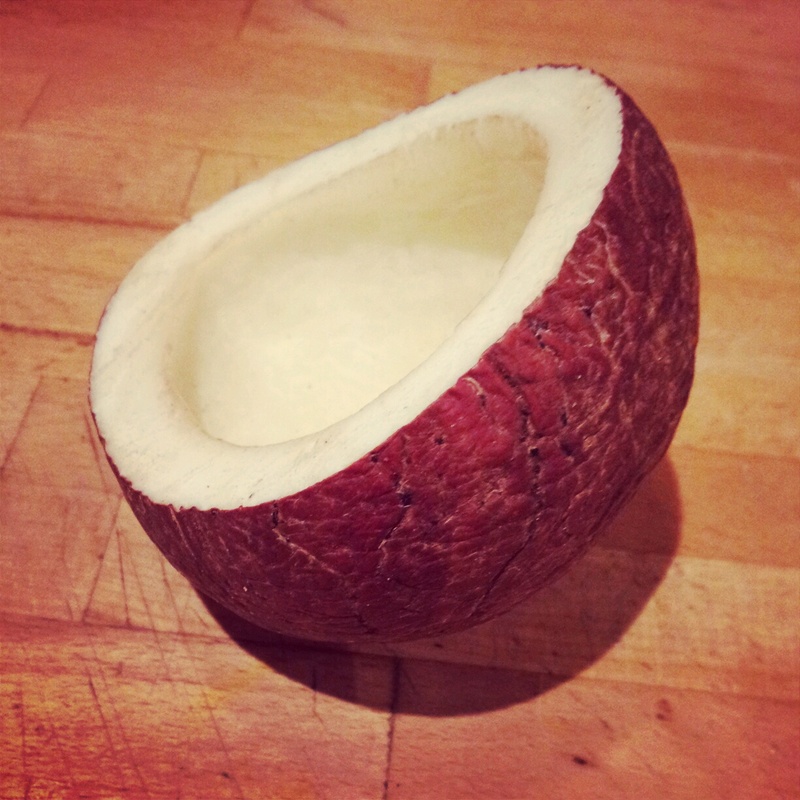 I quite like the dark brown edges of the coconut rind against the white coconut flesh. It’s makes a tasty decoration too! 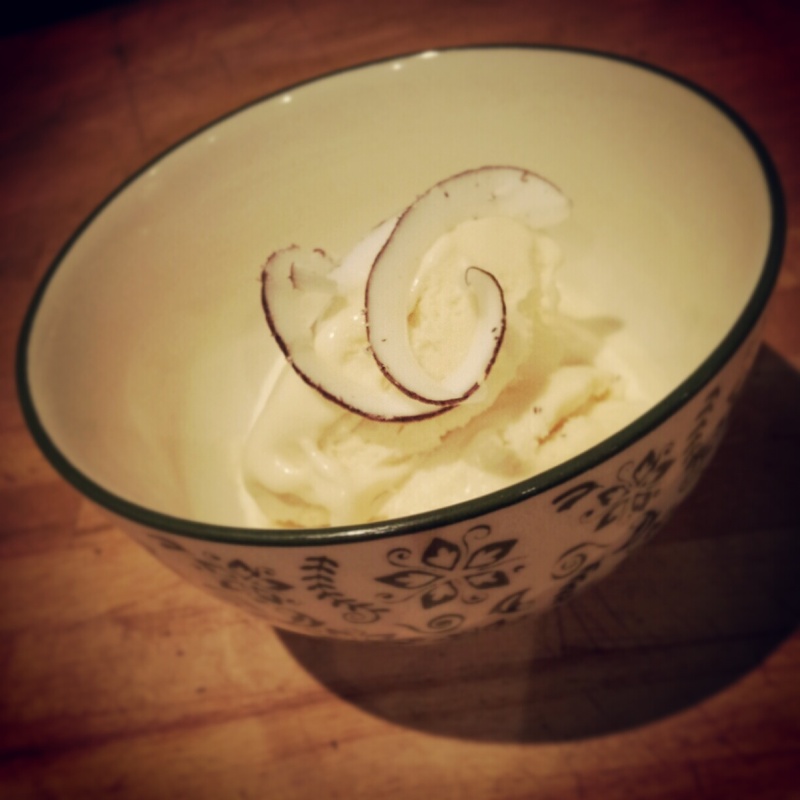 Pop a couple of curls on the top of your gelato for a quick and sophisticated looking decoration. 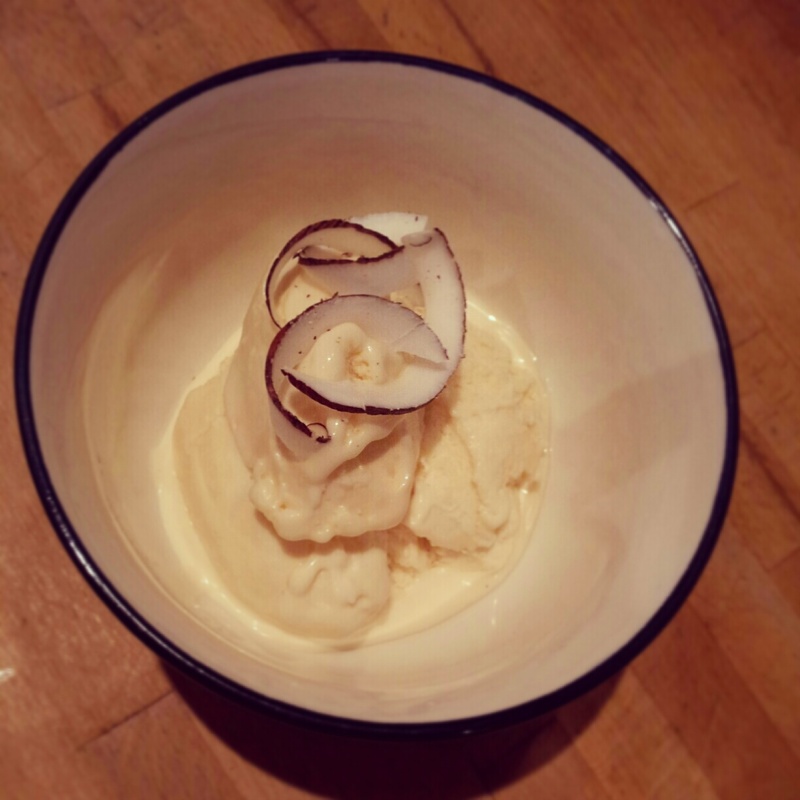 Sharing Coconut Gelato with friends – I didn’t eat it all myself. I promise! I didn’t eat it all myself. I promise! 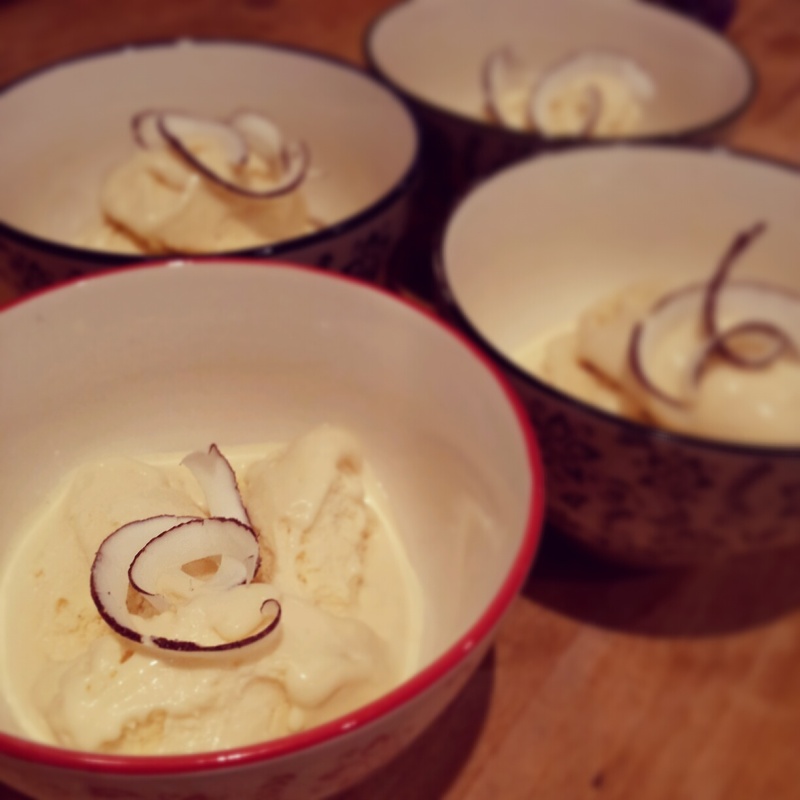 My friends came round for tea and we all quickly cleared our bowls of gelato which marks it as a clear success! It was smooth, creamy and extremely coconutty. Just my kind of gelato! I liked it so much that when I was washing up after my friends left I decided to start making some more custard, but this time I experimented with Italian Espresso Gelato instead. Keep 2 tbs of the desiccated coconut back to add to the soft set gelato before putting it into the freezer. Many thanks to Thomson Al Fresco who supplied the ingredients for me to make this Italian Gelato creation! If this recipe has whetted your appetite for all things Italian you might enjoy camping in the beautiful Lake Garda, Lazio, Tuscany, Adriatic Coast or the Venetian Riviera. 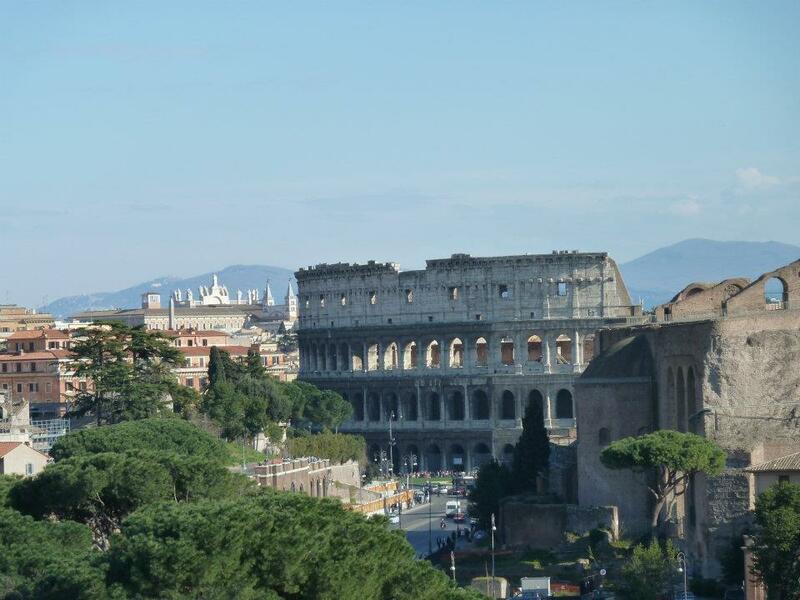 I’m already dreaming of my next Italian adventure. 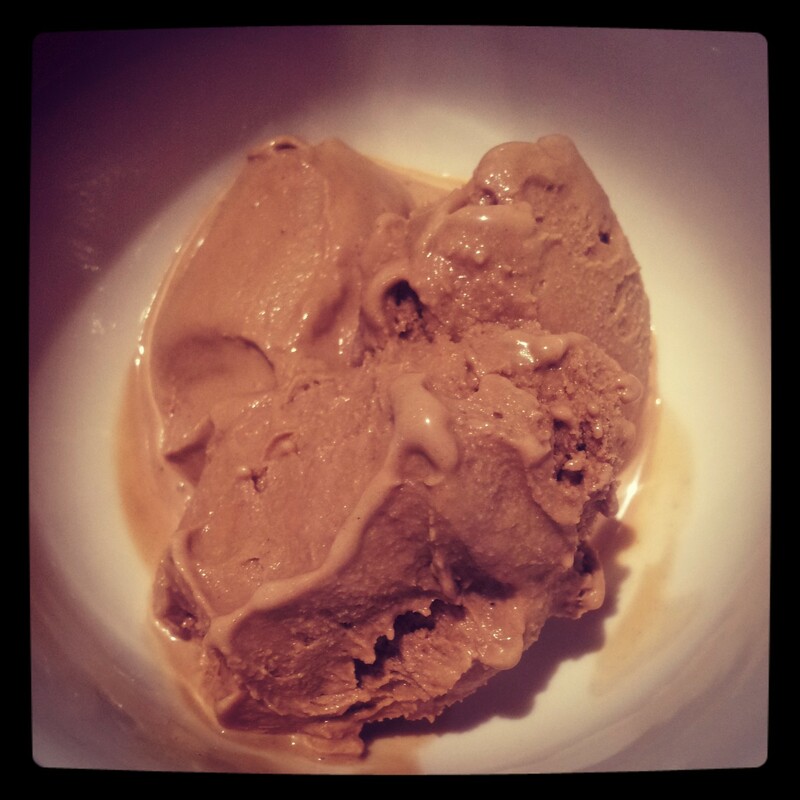 If you want to make another Italian classic you could try making your own Espresso Gelato, using the same method but a slightly different recipe.